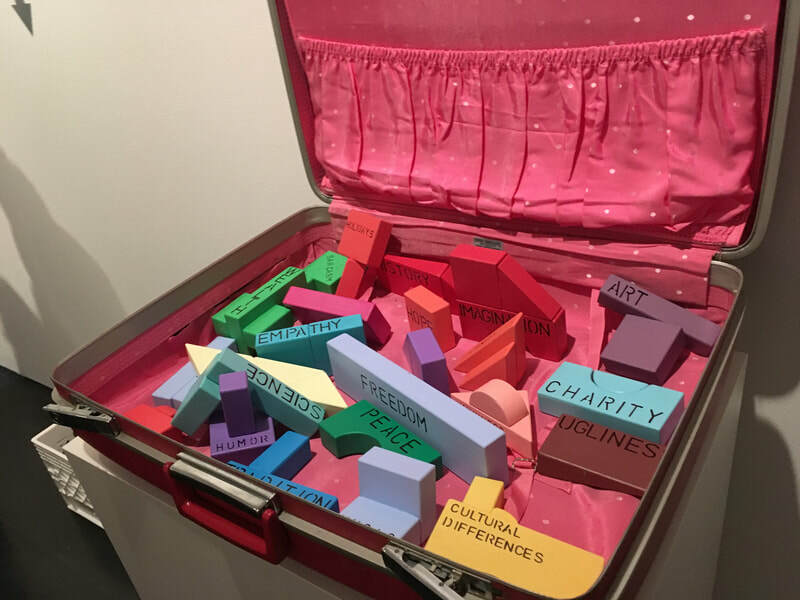 Pack Our Bags is interactive installation in which the public is invited to help The Traveler pack a suitcase filled with the values that will lay the groundwork for our next world. 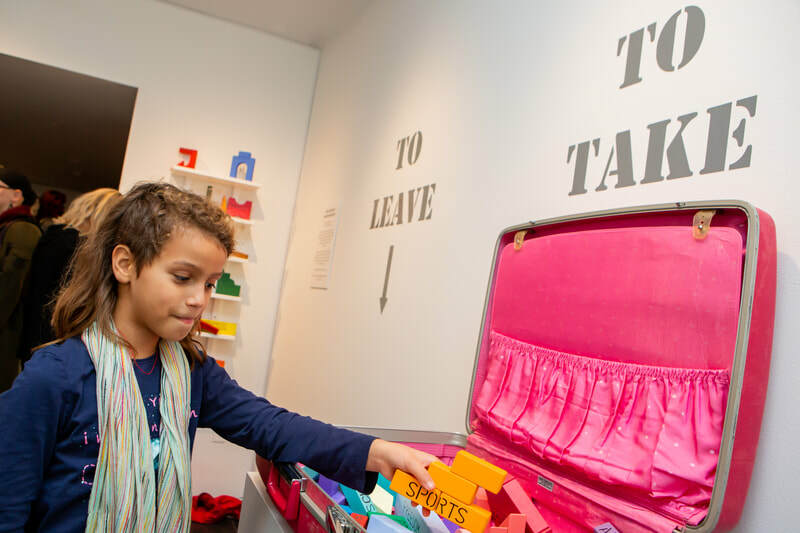 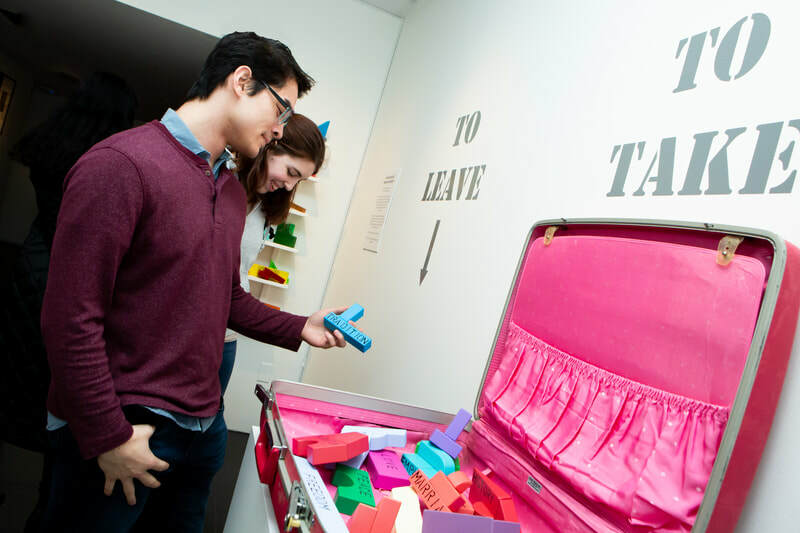 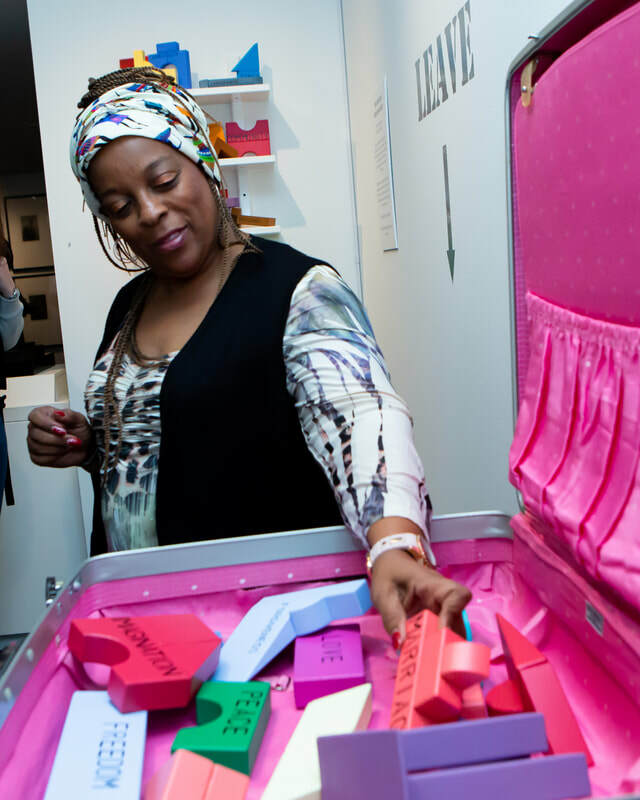 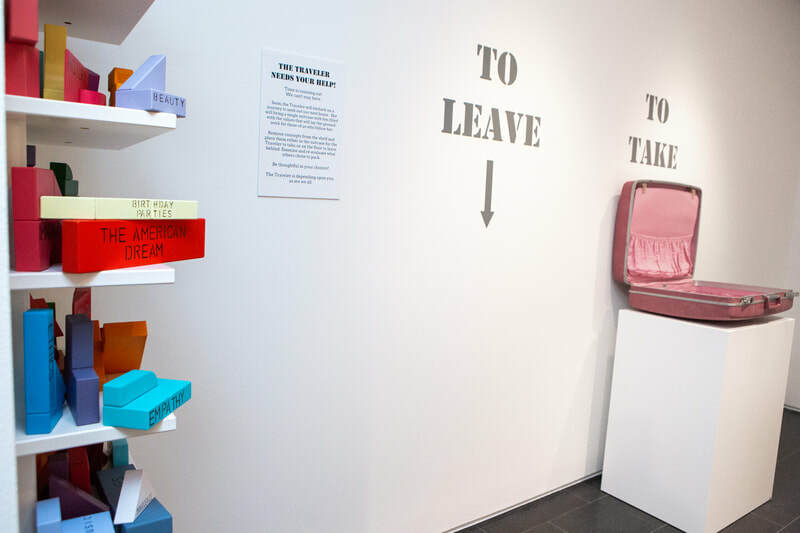 In this exploratory installation, the public is encouraged to examine concept sculptures created by the artist and place the objects either in the suitcase for the Traveler to take, or on the floor to leave behind. 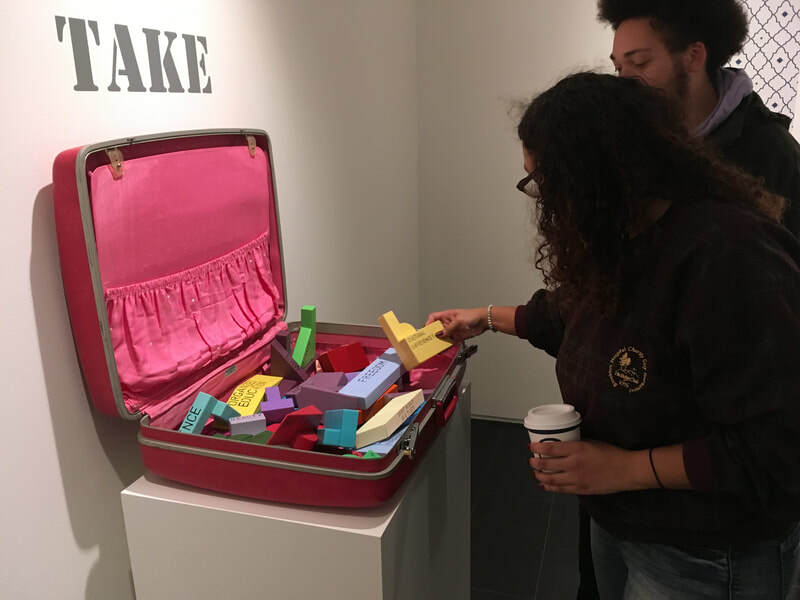 All are also invited to examine and re-evaluate what others chose to pack, and to re-place objects as they deem necessary. 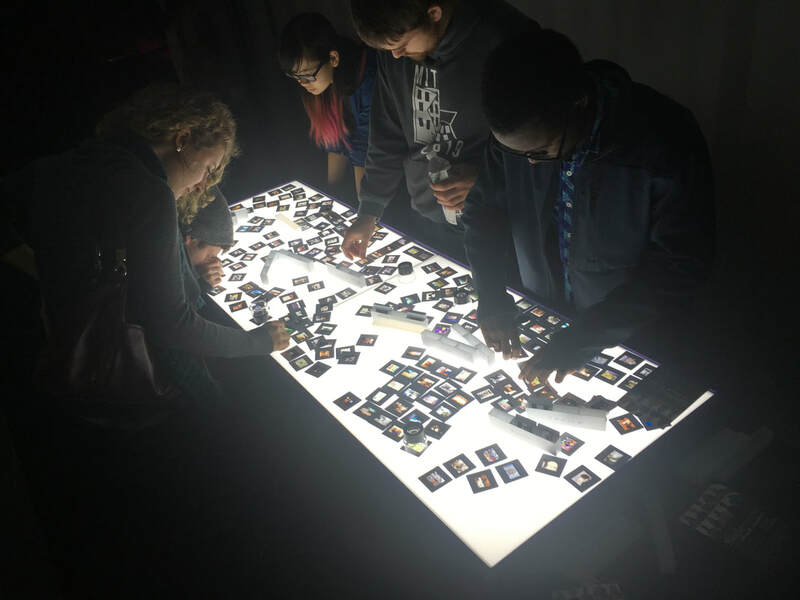 This interactive piece debuted as part of "Interstellar Sanctuary" at the Mills Gallery, Boston in Spring of 2018, and was redeveloped for "Nine Moments for Now" at the Cooper Gallery, Cambridge in Fall of 2018. "Pack Our Bags" is currently installed at the International Center for Photography in New York, NY as part of a special collaboration with For Freedoms. 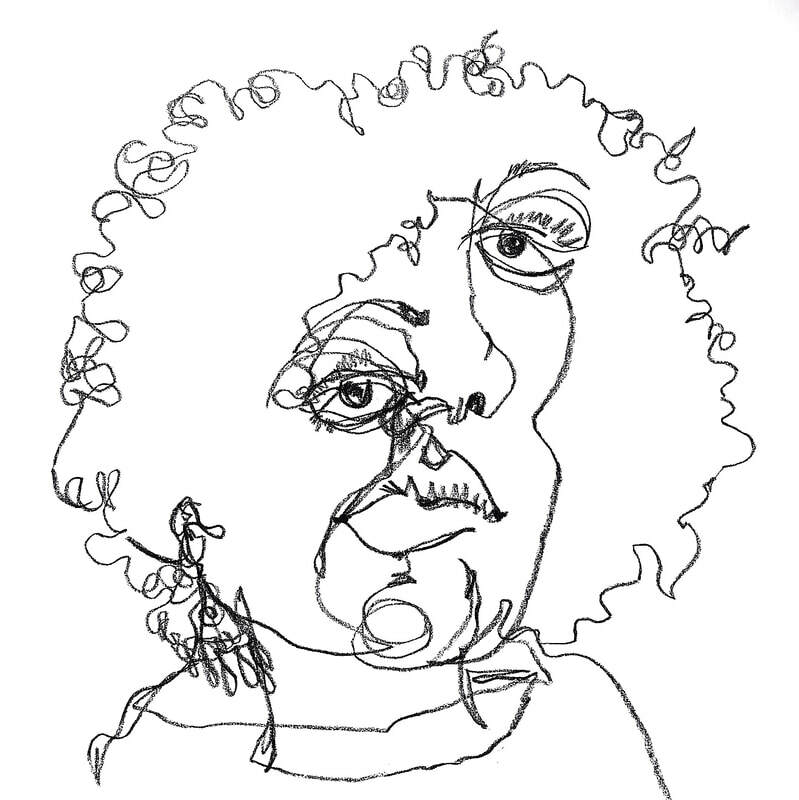 This continuing body of work explores my biracial identity through the introspective creation of​ ​continuous-line, blind-contour self-portraits; a drawing process that asks me to​ ​engage fully with my own visual form, and translate that form into line while not​ ​looking at what I am creating or lifting my mark from the page. 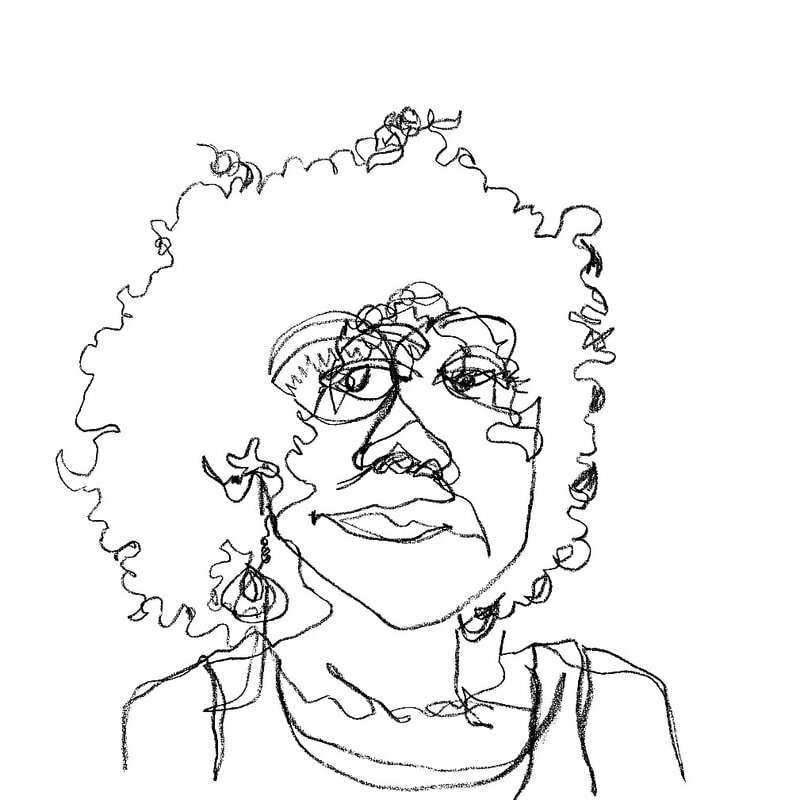 As a biracial person​ ​how I am seen shifts in the eye of the beholder and depends on social context. 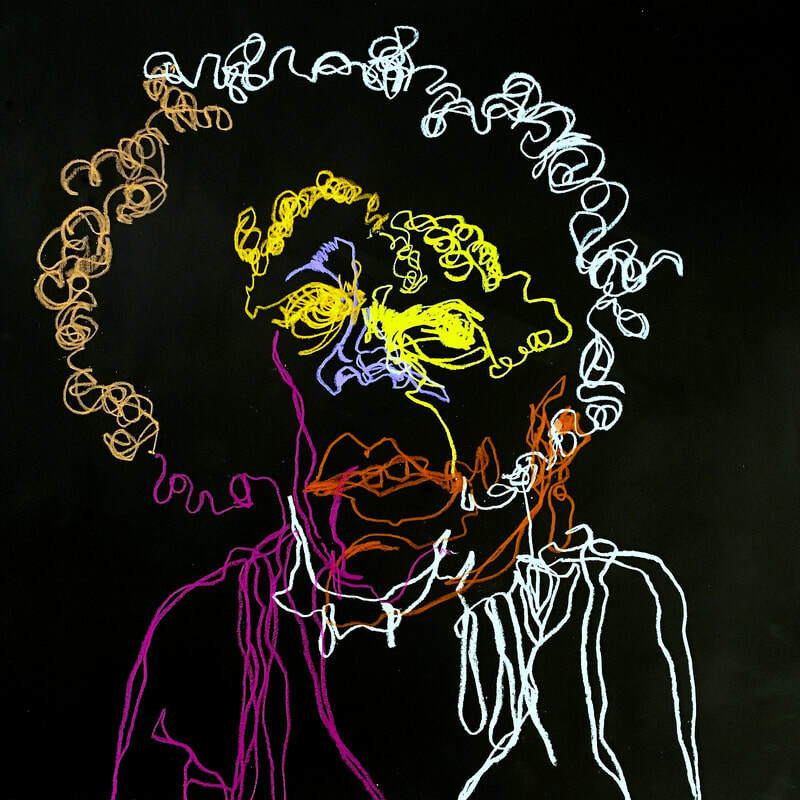 Through these explorations I contemplate my own visual form while relinquishing the​ ​ability to control how I look. 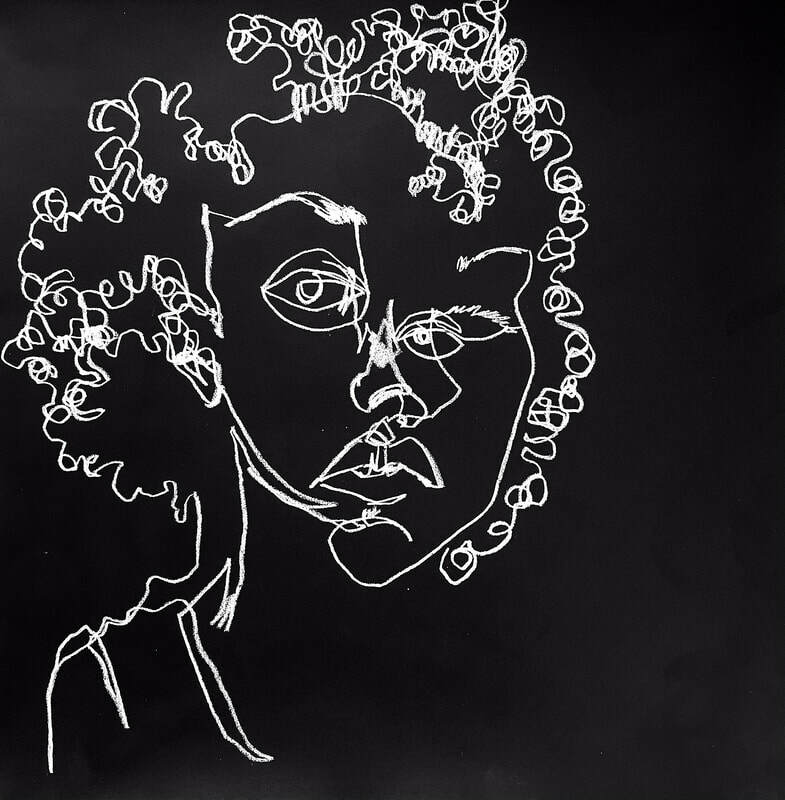 I embrace a process of discovery that asks me to truly​ ​see myself, and asks the viewer to find me within, and beneath, the wandering lines. 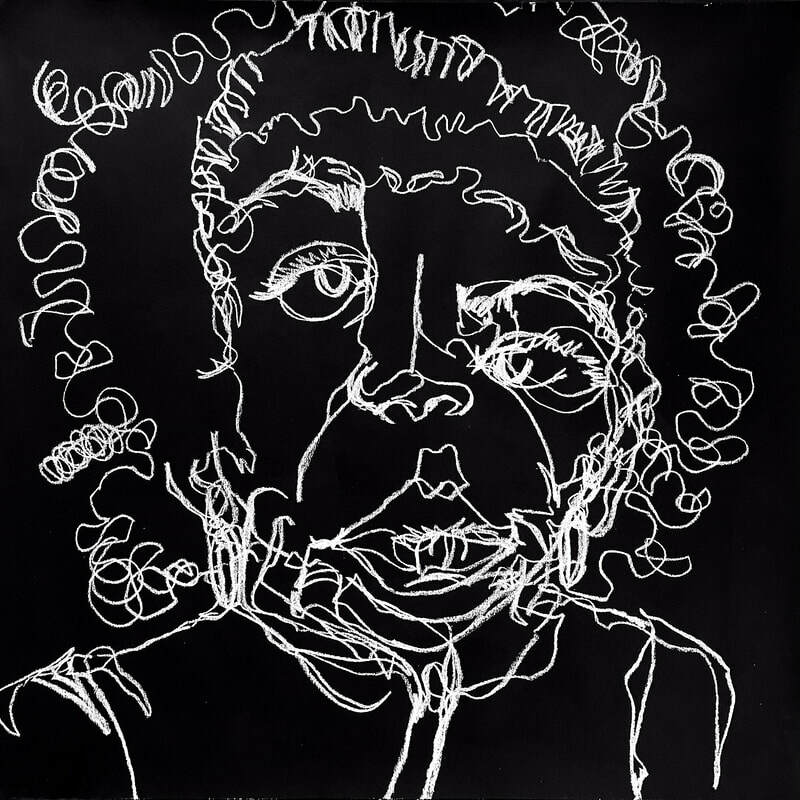 These ​drawings began in black and white, but gradually shifted towards​ ​multicolored expressions of self. 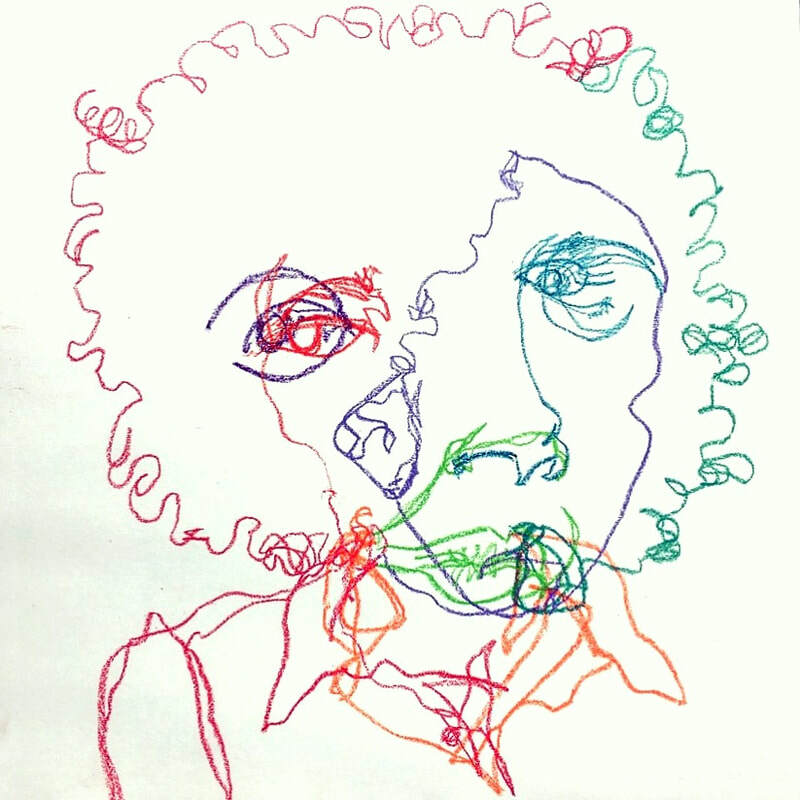 Through this process I have discovered that none of​ ​us are just one thing- we are all multicolored beings beneath the surface. Drawings are crayon on paper, and gesso and crayon on paper, approximately 22" x 22" each. 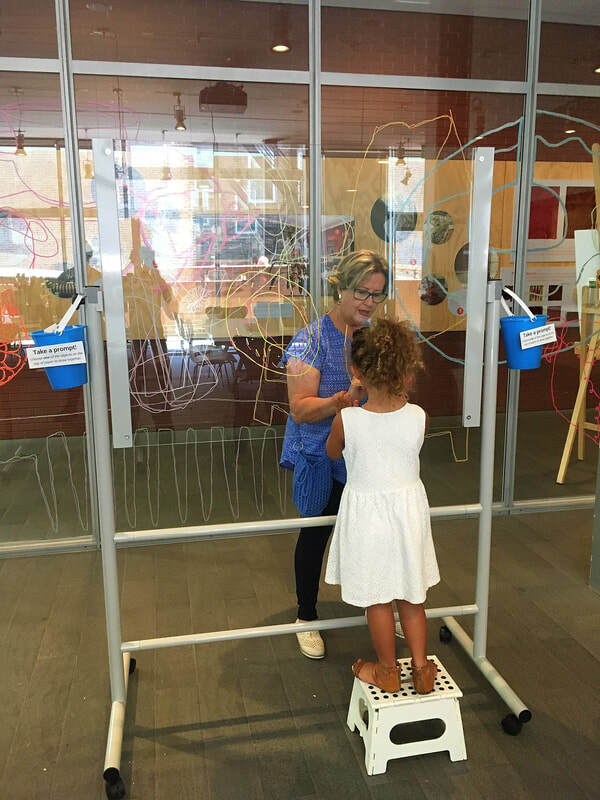 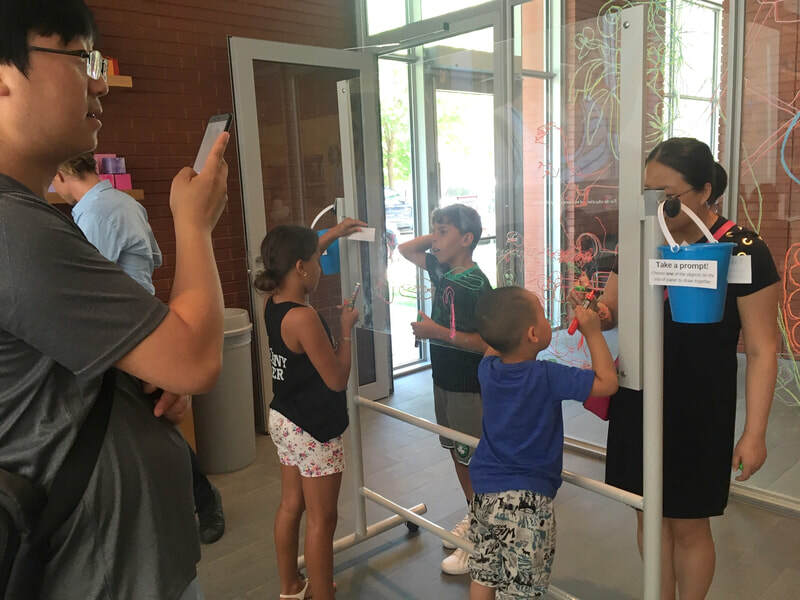 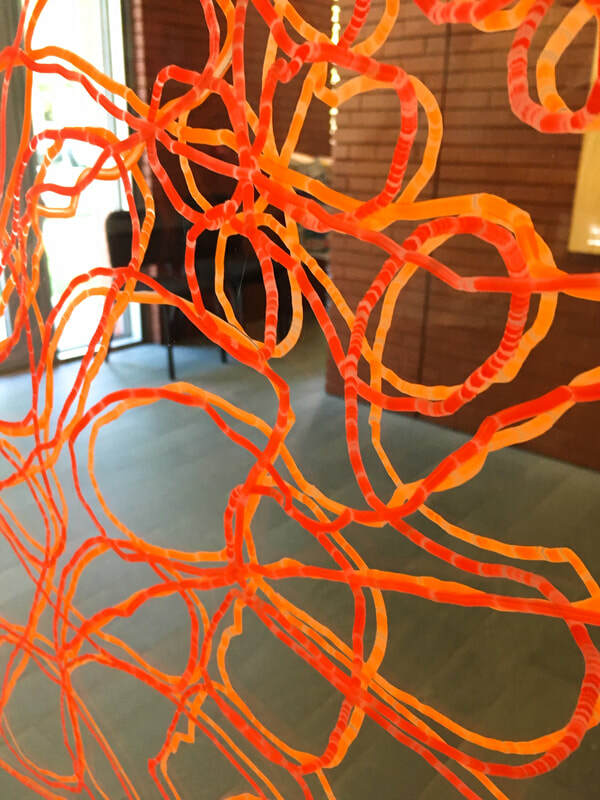 Drawn Together was a collaboration with fellow artist Graham Yeager that took place at Isabella Stewart Gardner Museum in Summer of 2018. 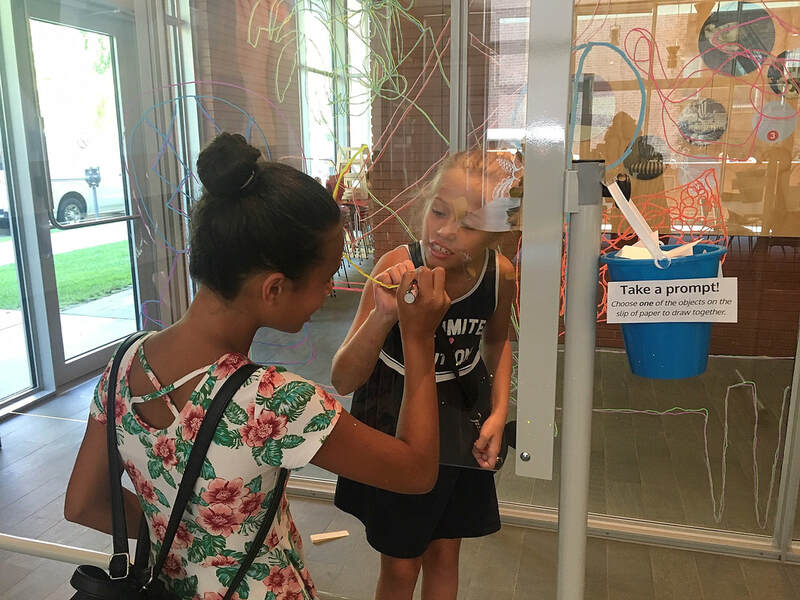 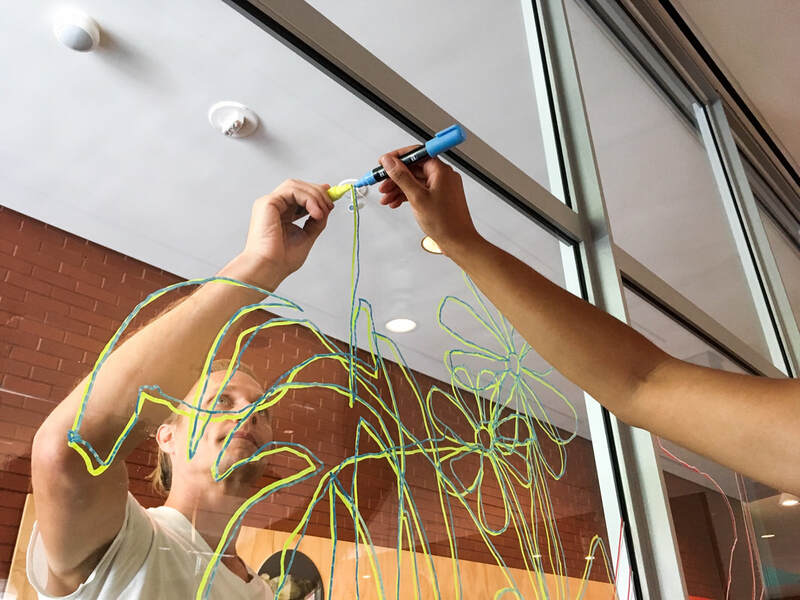 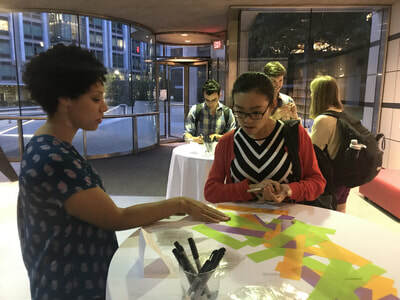 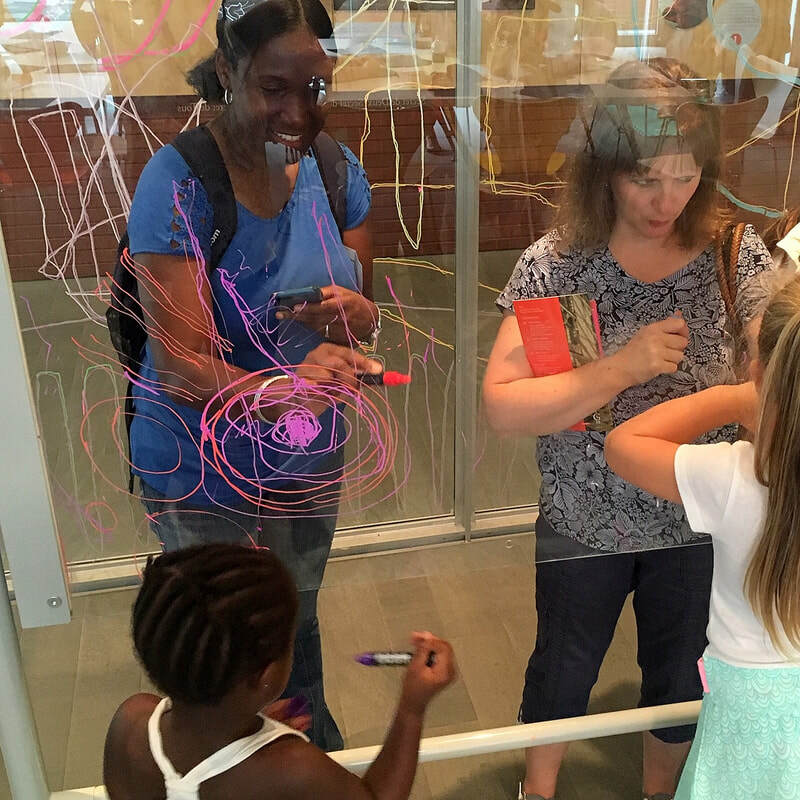 The project consisted of an expansive collaborative glass drawing that was created on-site by the artists, as well as a one-day interactive program in which museum visitors were invited to make their own collaborative drawings. 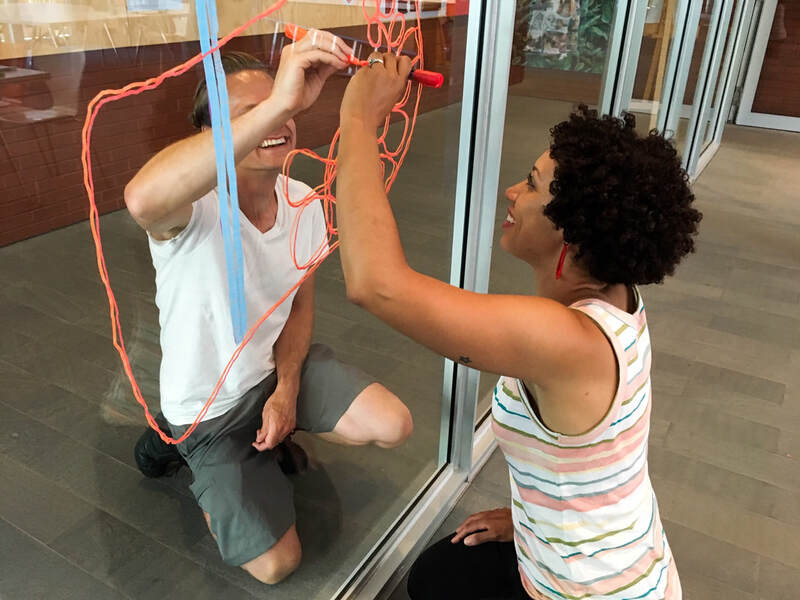 In the Drawn Together method, partners stand on either side of a glass panel and pull a random selection from a pool of object prompts that were developed by the artists. 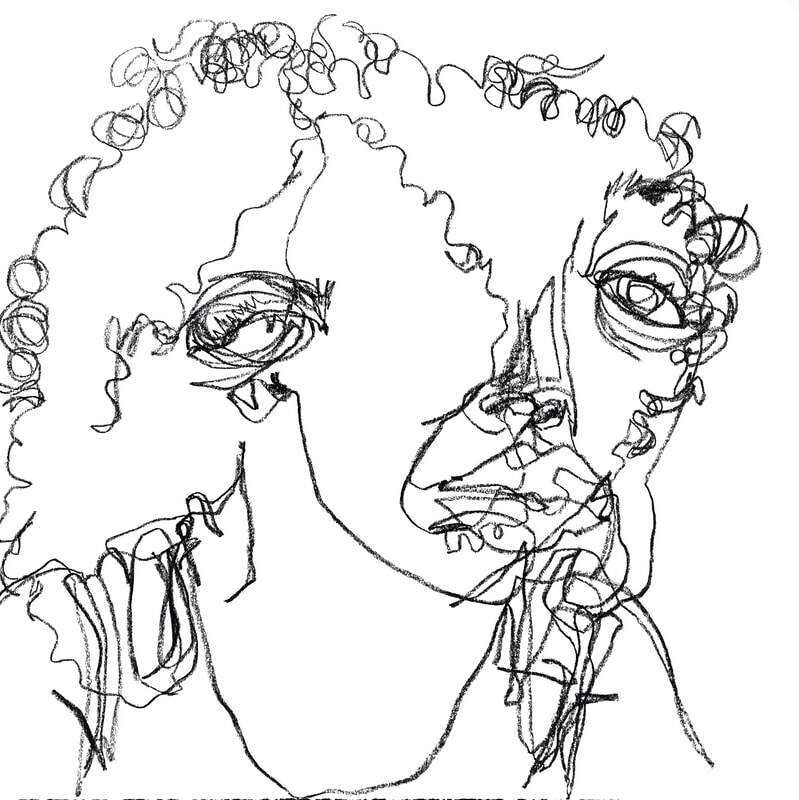 After both partners have seen the prompt, the pair must create a single drawing together with markers tip to tip on either sides the glass. 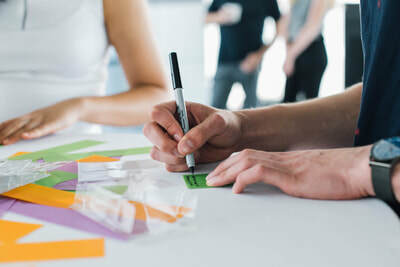 While creating the drawing, partners strive to keep their connection to the other's marker without speaking, and without knowing where the drawing will begin, or how it will end. 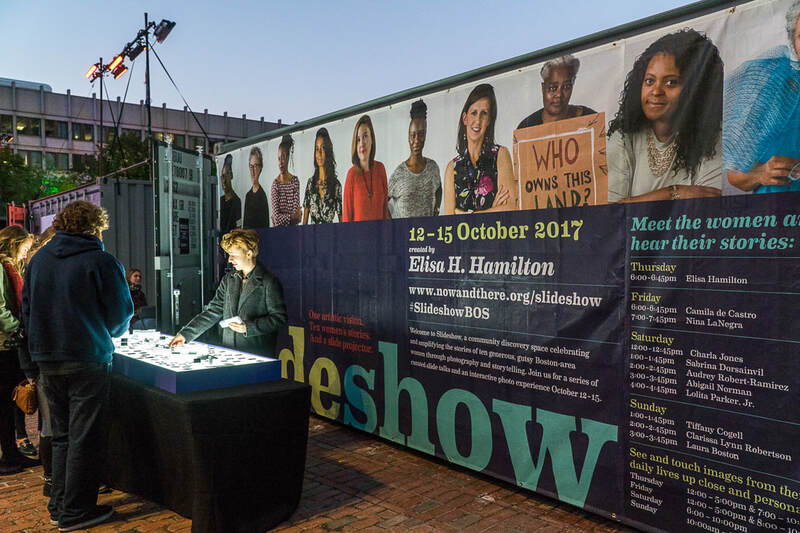 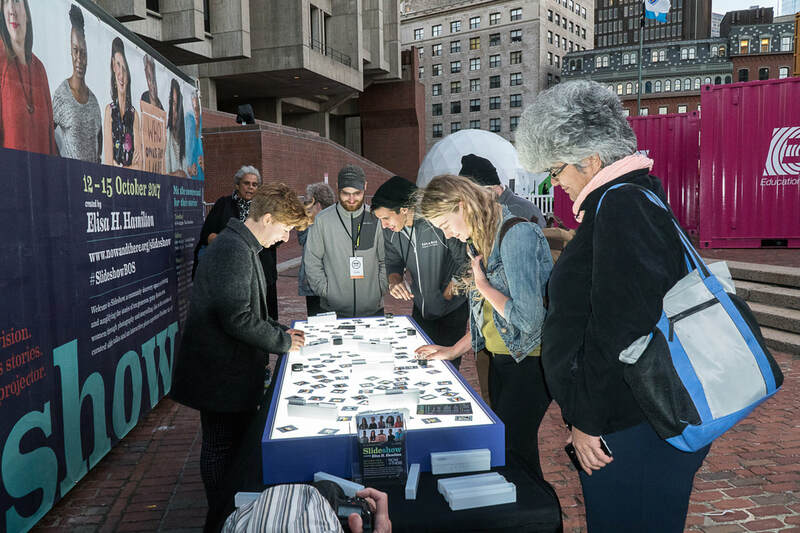 Commissioned by Now+There, Slideshow took place October 12 - 15, 2017 as part of HUBweek on Boston City Hall Plaza. 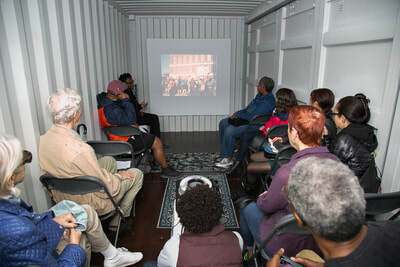 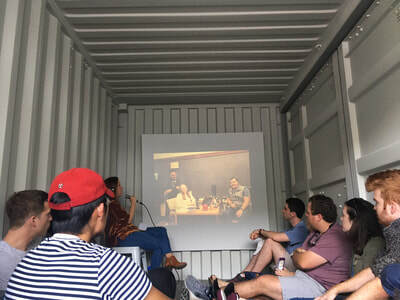 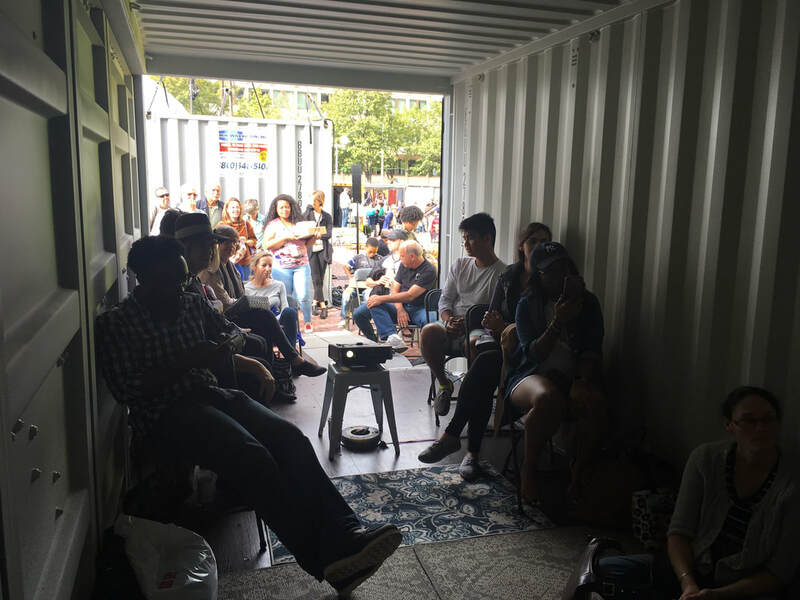 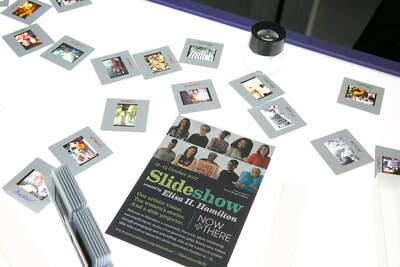 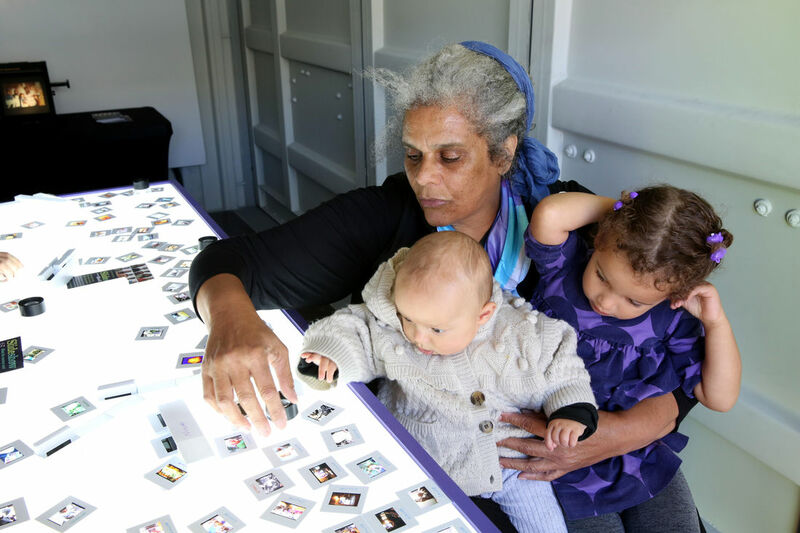 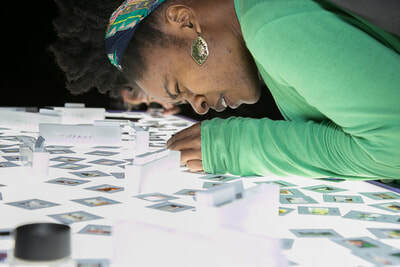 The project was a series of curated slide talks and an interactive photo exhibit taking place in and around a 20' shipping container. The artist invited ten Boston-area women from varying backgrounds each to photograph a week in her life and then to choose 25 images that she would use to tell her story in an analog slide talk. Slideshow amplified and celebrated the life experiences of ten generous, brave, Boston-area women through photography and storytelling, and invited the public to share in the day-to-day work, family life, and social context of each woman through the women's talks and through physical examination of the images on a communal light table. 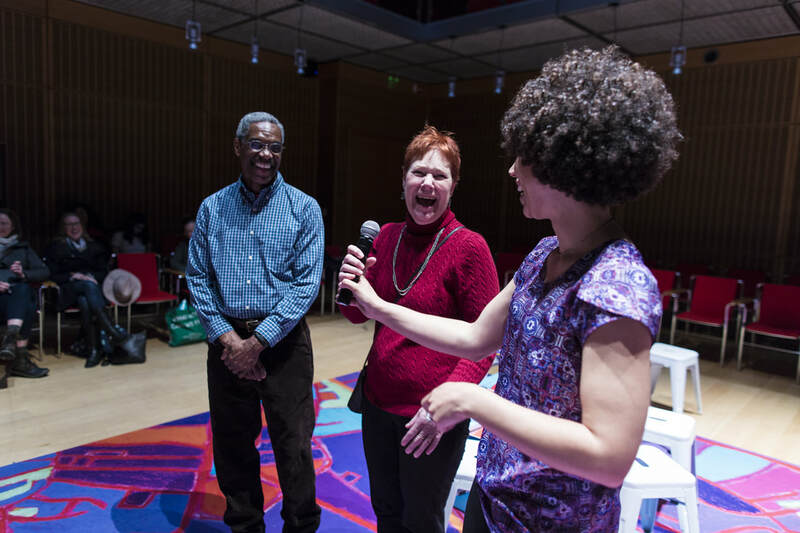 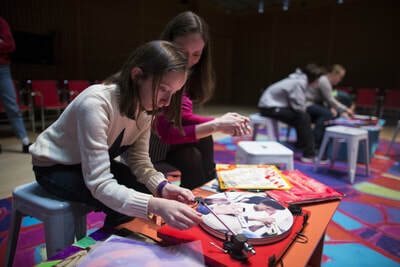 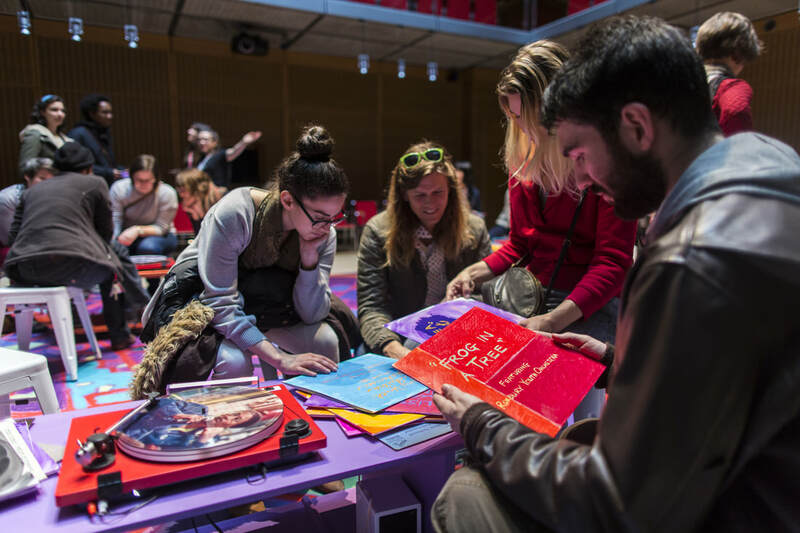 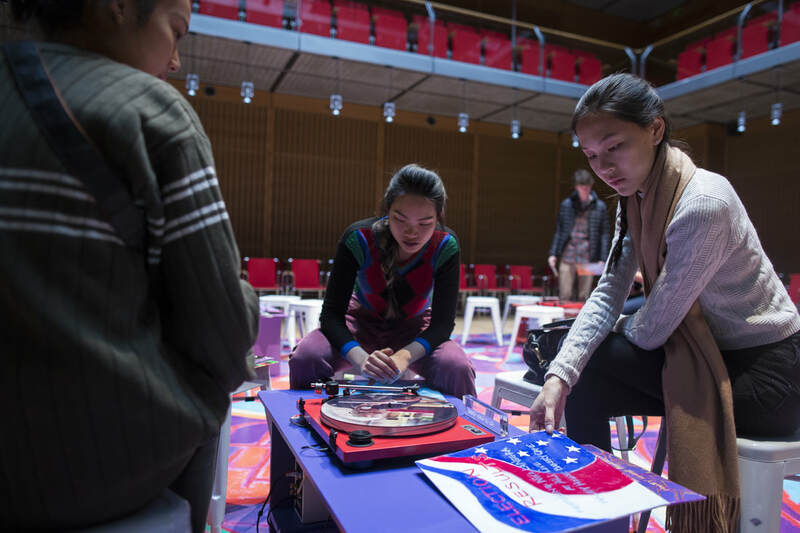 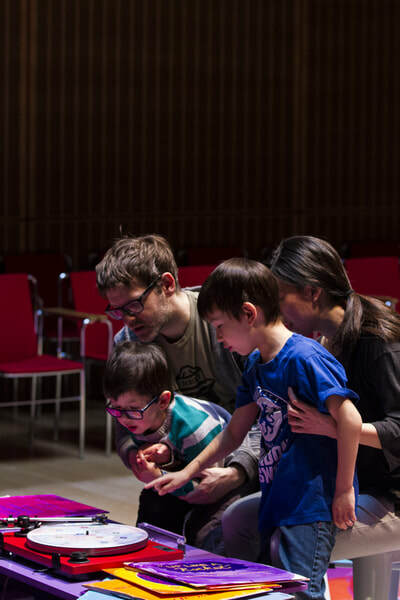 Over the course of one week in March 2017, Elisa Hamilton transformed the Isabella Stewart Gardner Museum's Calderwood Hall into a hands-on community listening space that featured the sounds of our Boston communities. 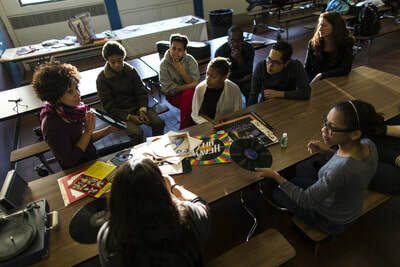 In this six-month collaboration with four local community organizations, the artist taught workshops focused on listening more closely to the sounds of our ordinary lives, and recorded each community group at work. 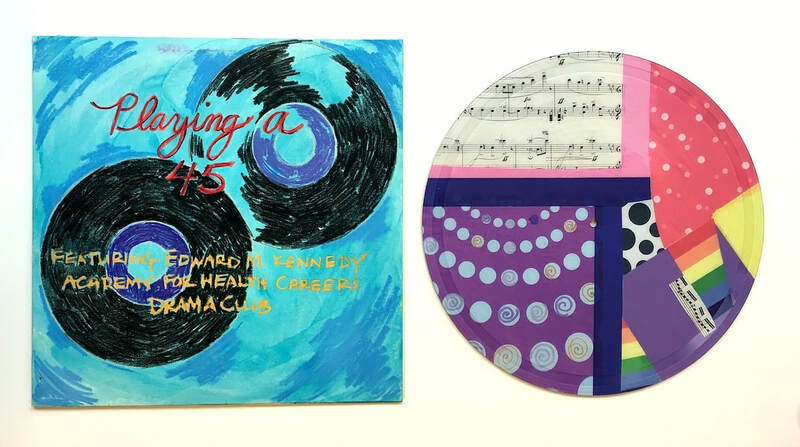 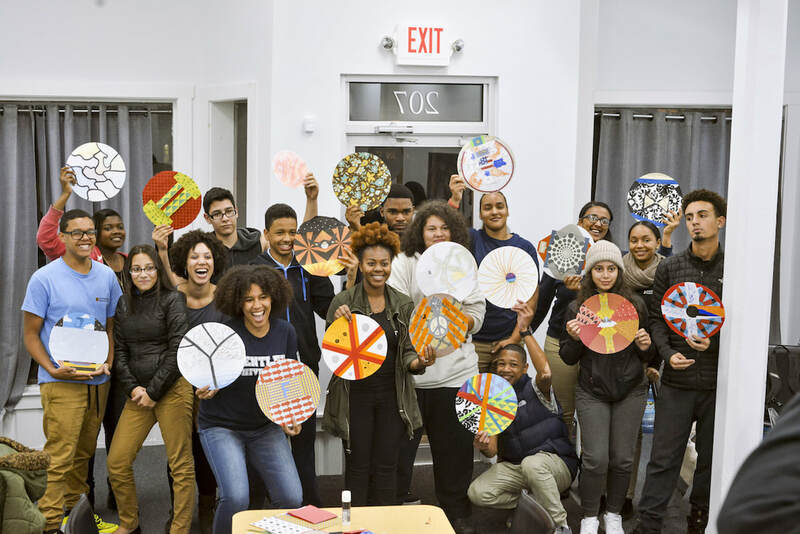 From this audio, the artist created a collection of 39 custom picture discs that featured the sounds and images of the community groups. The "Sound Lab" featured the custom records along with a selection of vintage records curated to reflect Boston’s rich musical traditions. 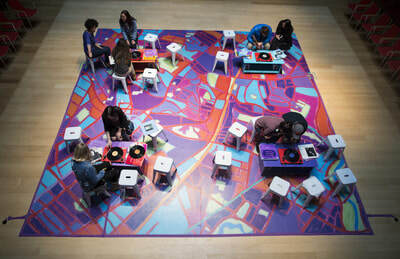 The artist created a 20' x 20' map of Boston, atop which visitors were invited to touch, hold, and play the records on locally made turntables. 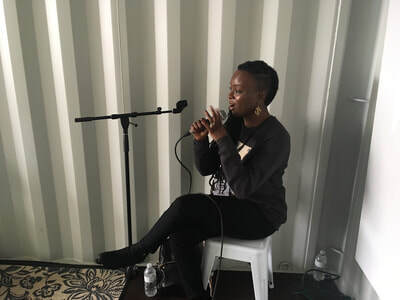 During the run of the installation, the artist curated workshops and performances lead by community partner organizations, and hosted an Sound Lab Open Mic each day with a different theme. 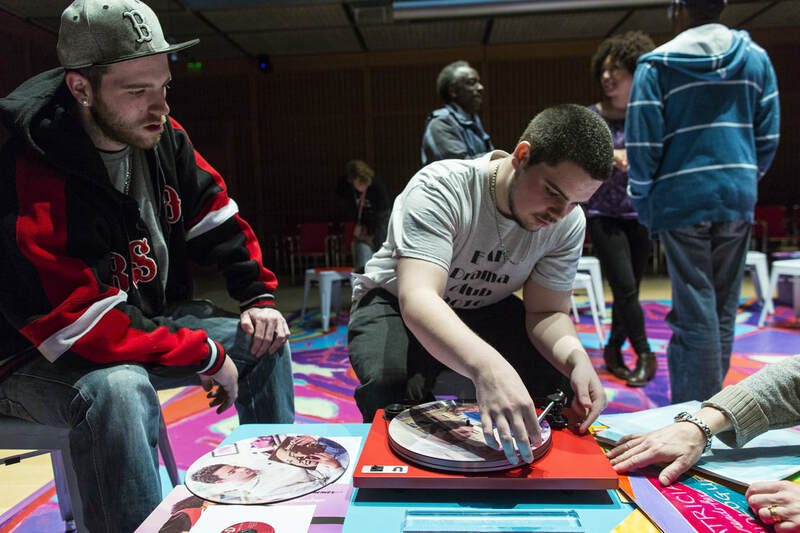 At the conclusion of the exhibition, the record collections and turntables were gifted to each community partner. 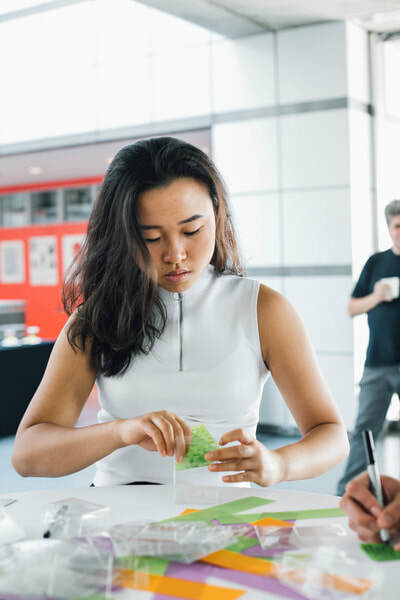 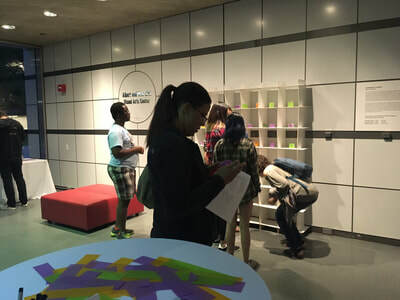 In September 2017, Elisa Hamilton collaborated with the MIT List Center for Visual Art to create a participatory installation in response to the institution's Student Loan Art Program. 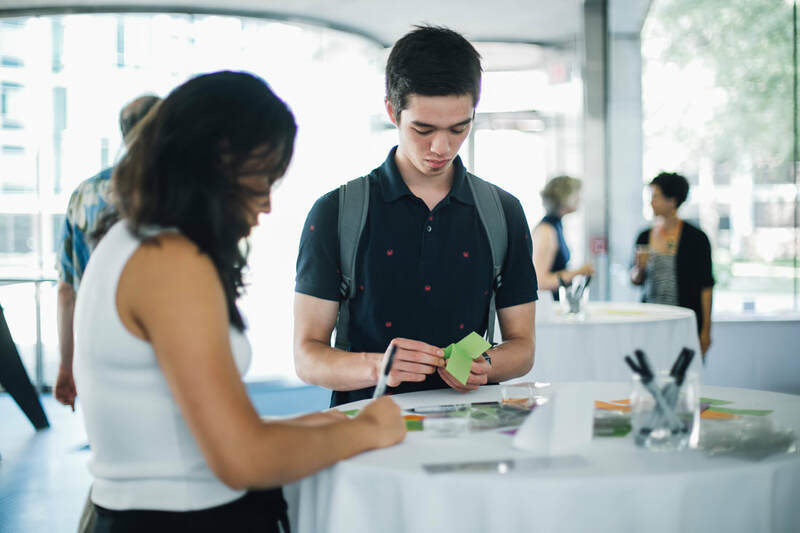 The Program is an annual tradition since 1969, which allows students to borrow artworks from the List's permanent collection and keep in their homes for the school year. 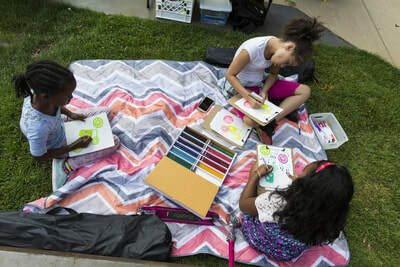 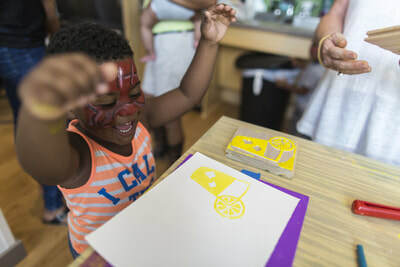 The artist was moved by the generosity of this program, which, instead of hoarding valuable works of art, lends them to students to be enjoyed, creating a positive daily impact in the lives of community members. 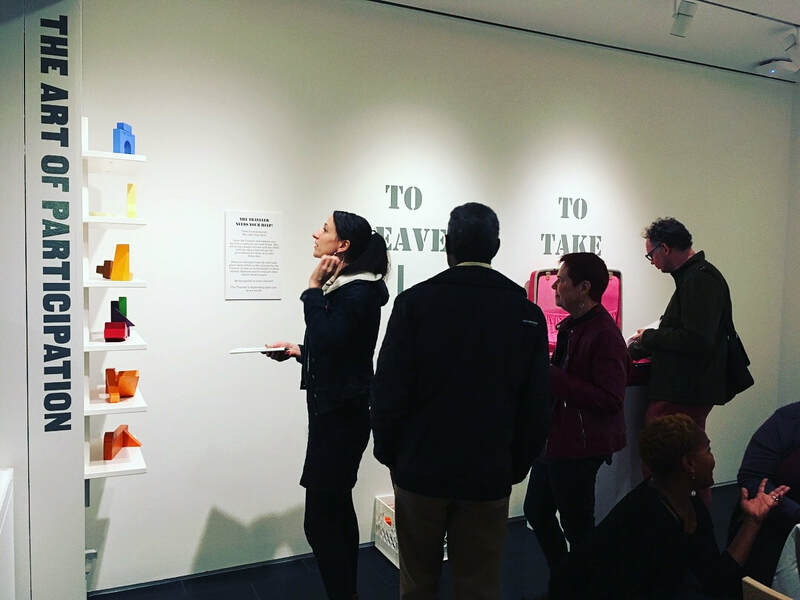 In the spirit of the generosity of the Student Loan Art Program, the artist asked community members a question about their own giving: "what will you leave behind?" 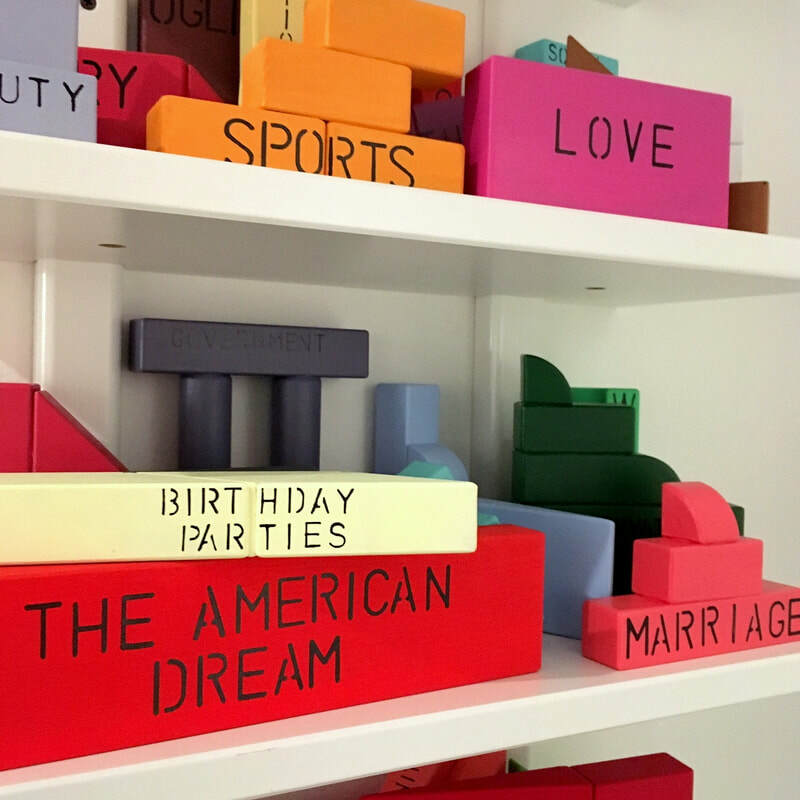 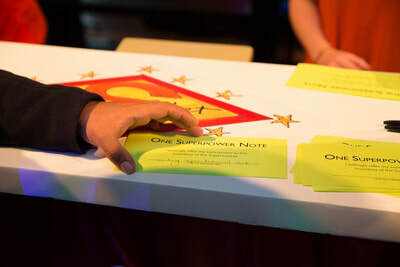 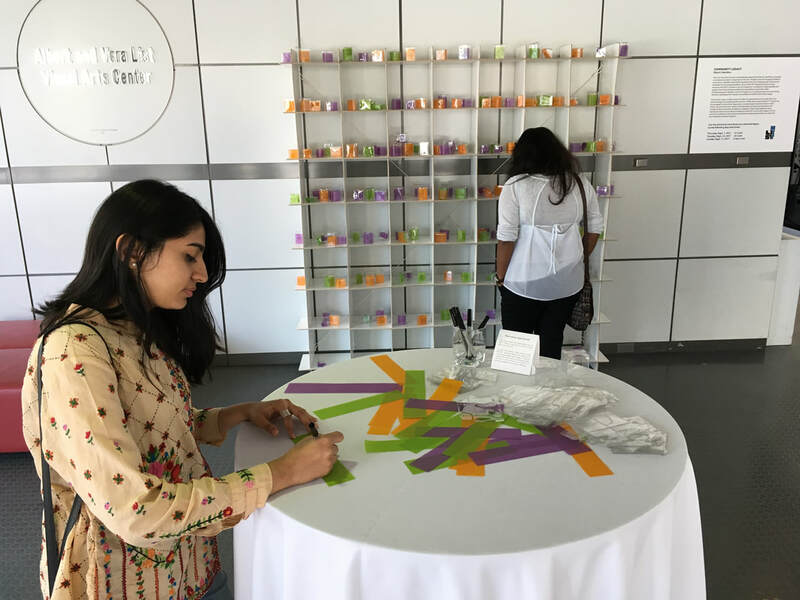 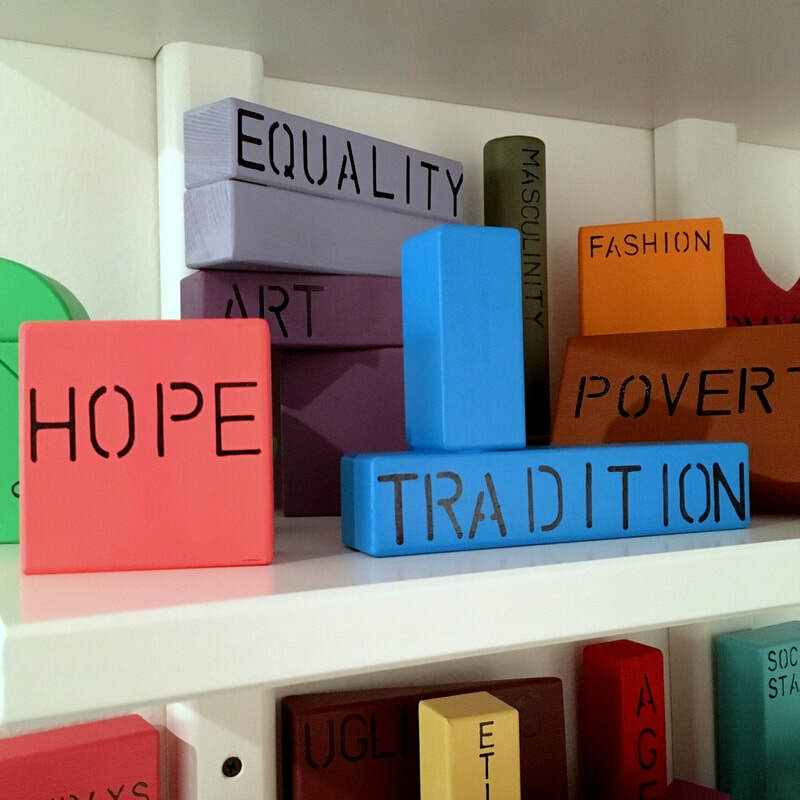 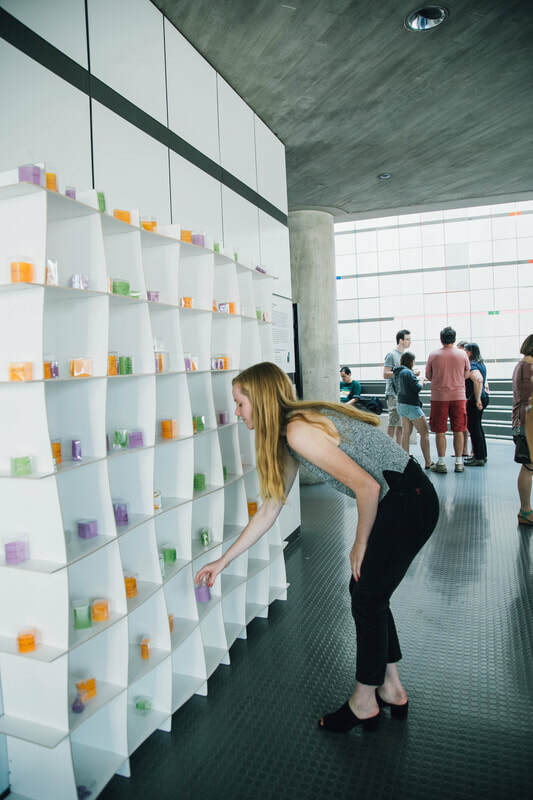 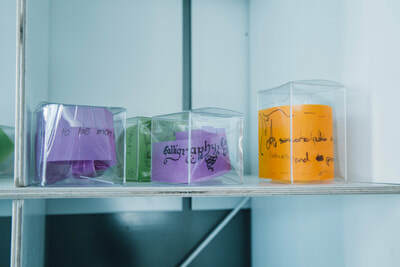 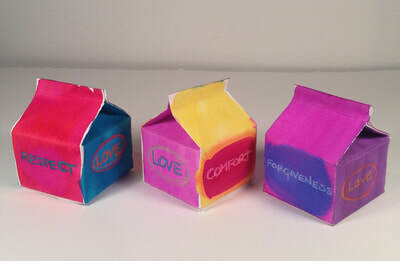 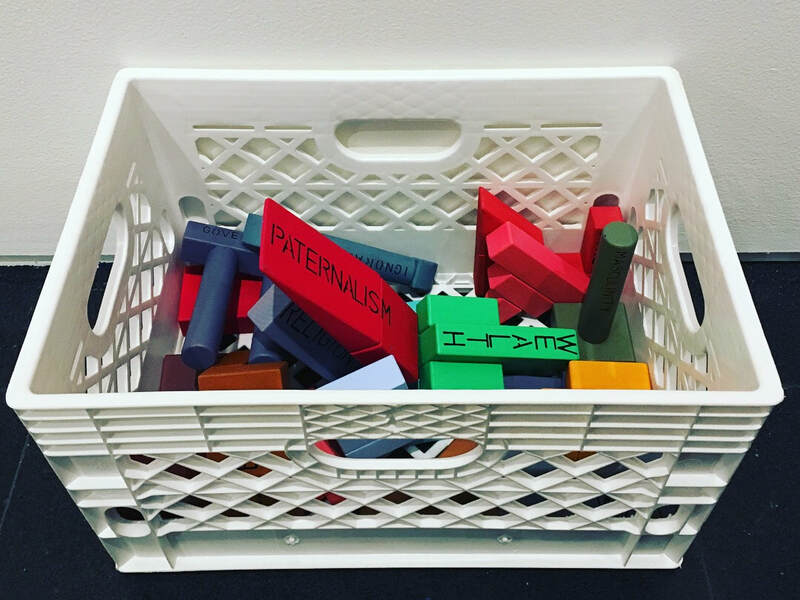 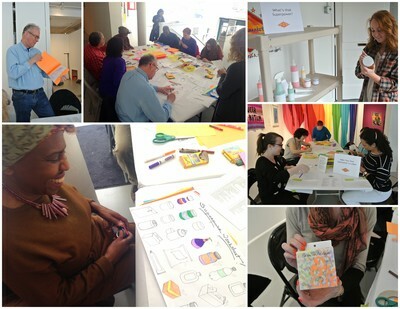 Participants were encouraged to write down their response, tuck it into a box, and place it on a shelving unit that became a growing, physical evidence of community offerings. 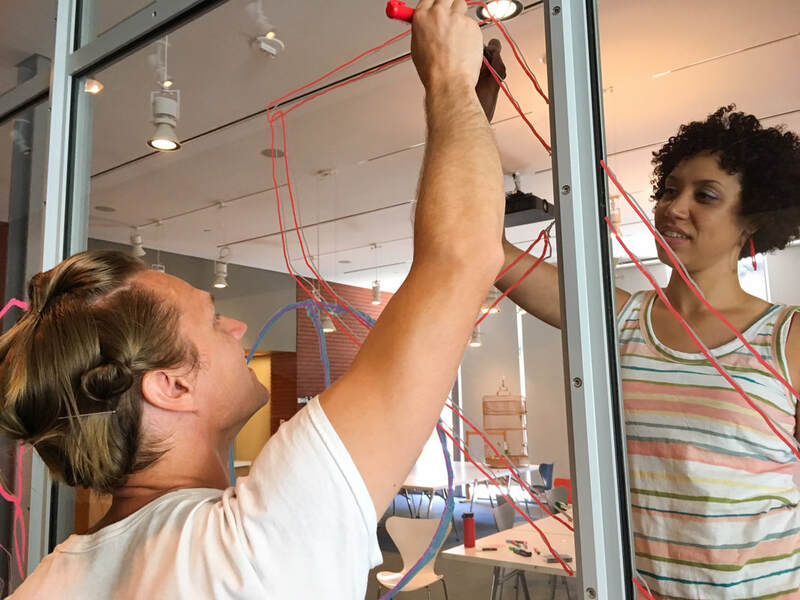 Participants were encouraged to explore others' responses by peering through the clear acrylic vessels to the writing inside. 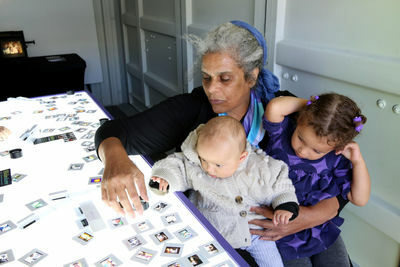 The 179 results have now been digitally catalogued and are published online as public evidence of the community’s legacy. Dance Spot is an ongoing public art project, in which the artist creates pop-up dance floors in unexpected places and invites the public to dance. Dance Spots are individually created for each location by the artist with different design and choreography for each spot. 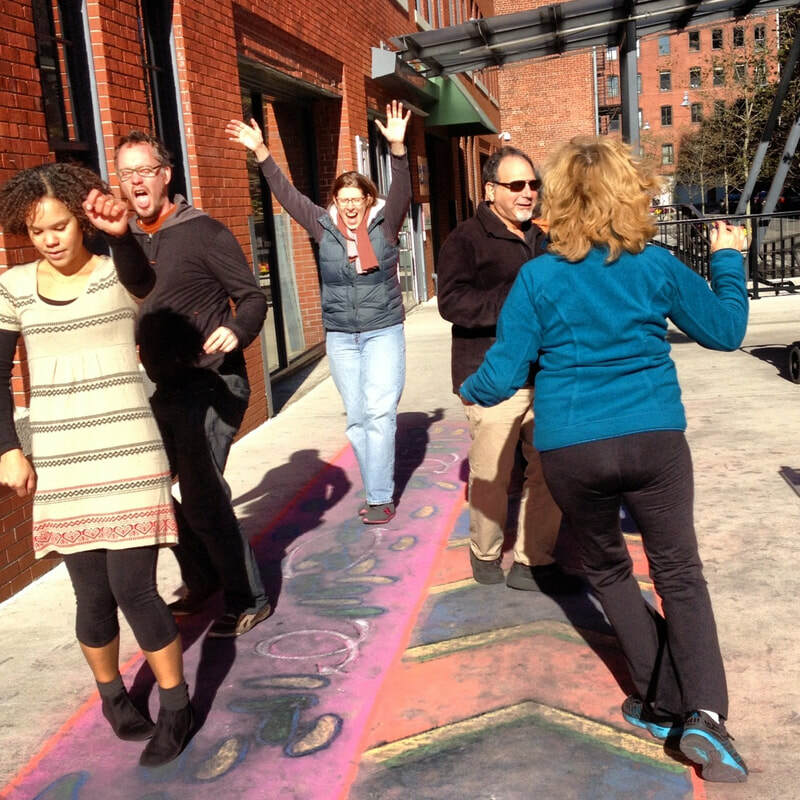 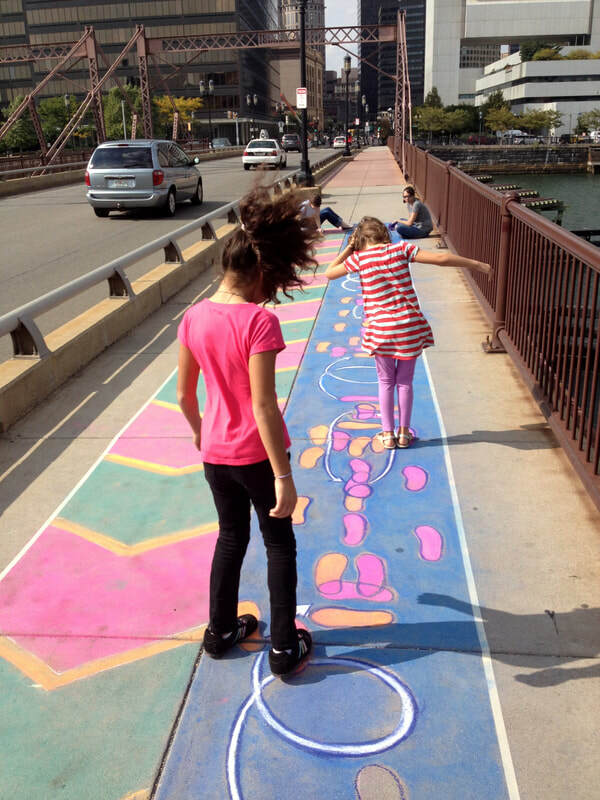 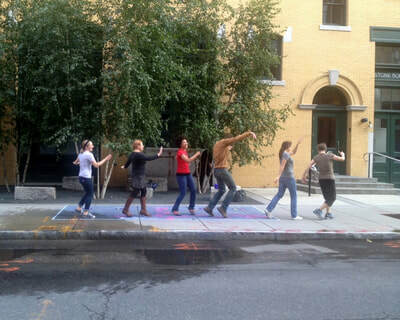 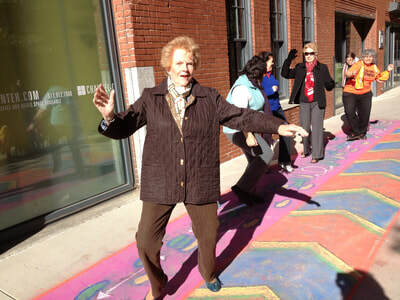 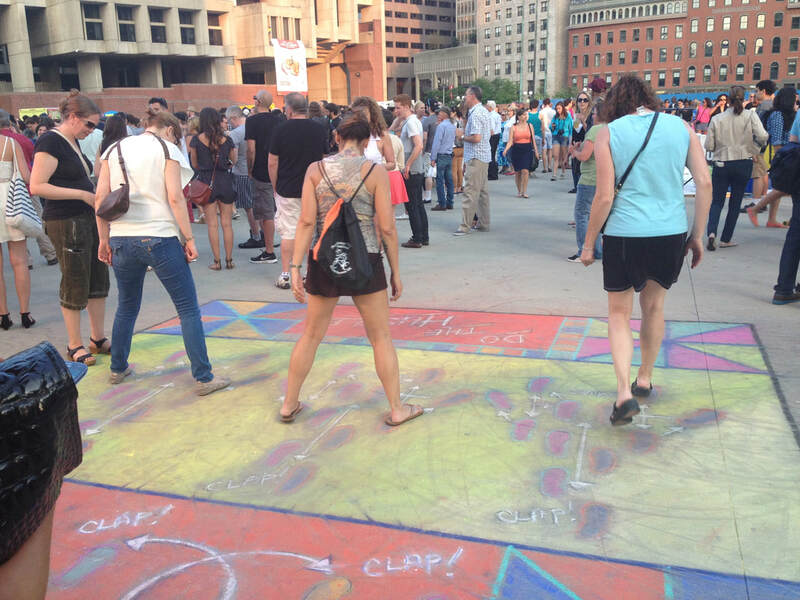 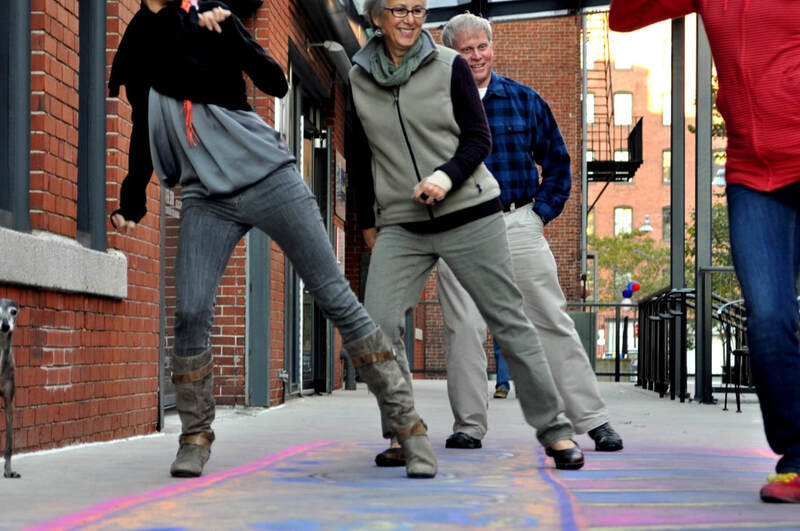 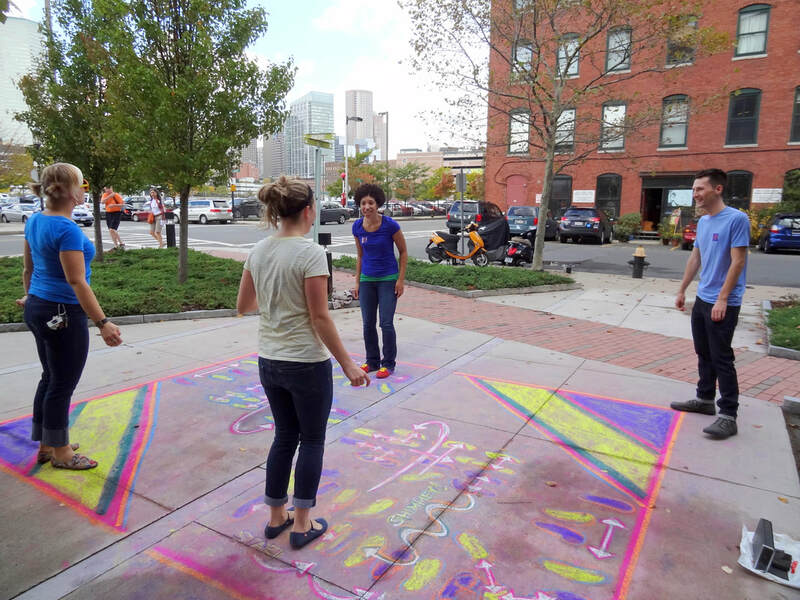 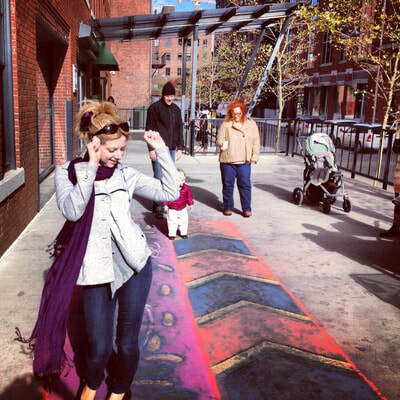 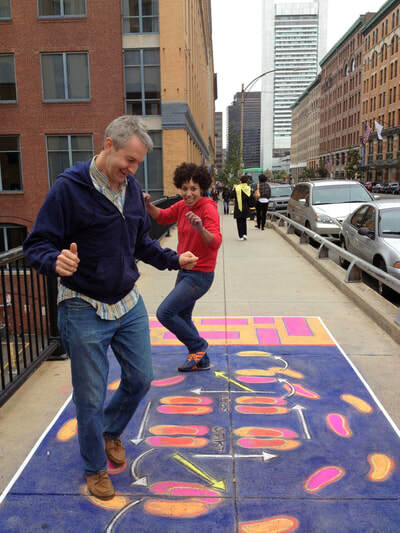 In Dance Spot’s foundational iteration, the artist transformed the sidewalks of Fort Point into impromptu dance floors. 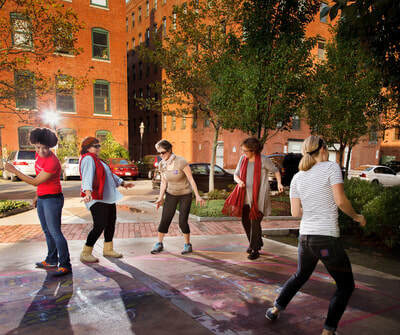 The original project consisted of five dance spots - places to dance - prominently located throughout the Fort Point neighborhood. 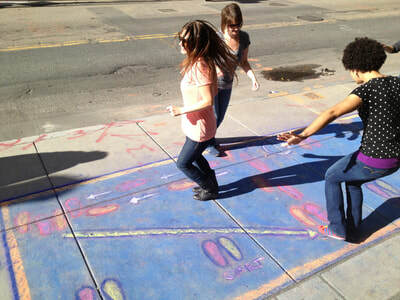 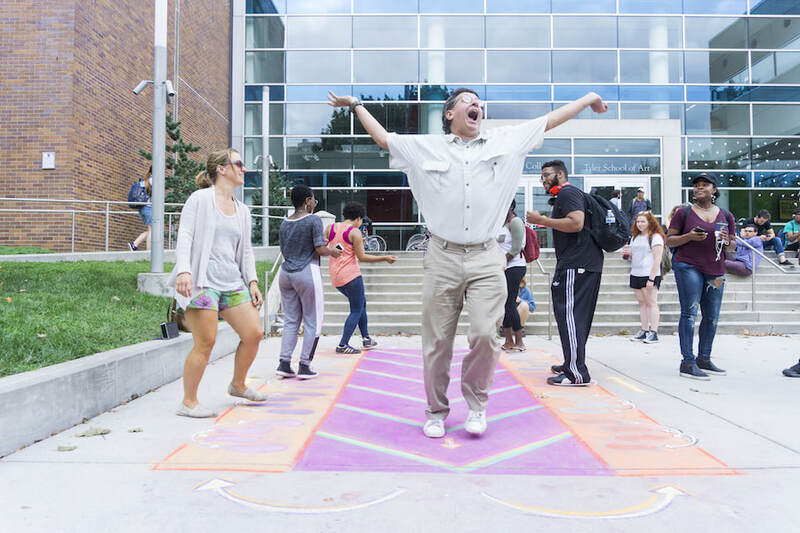 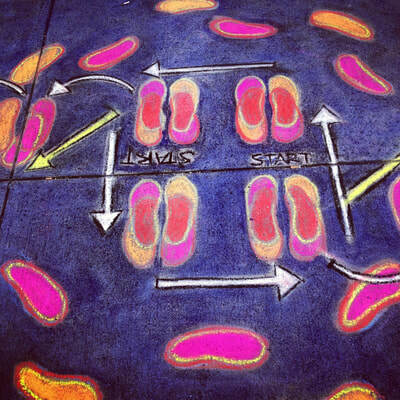 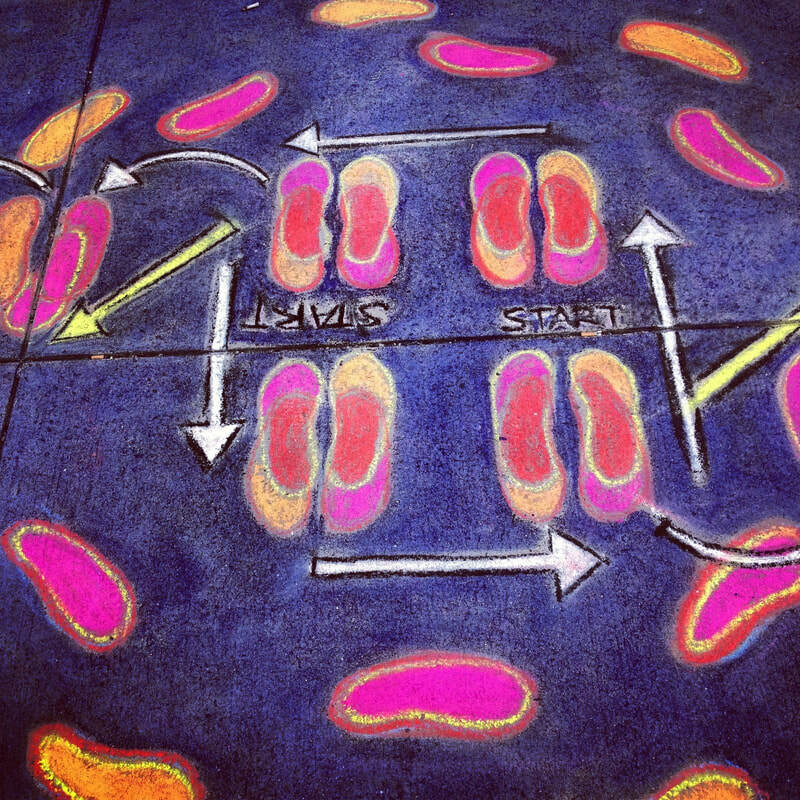 Each Dance Spot had a colorful dance diagram drawn on the sidewalk, illustrating a specific dance routine that paired with a specific song. 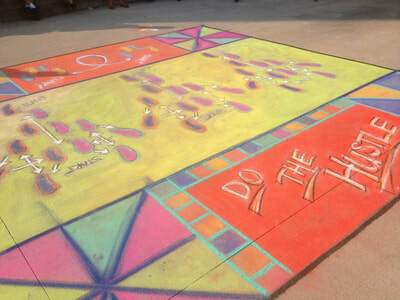 Each installation also featured signage that directed the public to the Dance Spot website, where one could stream the songs, watch videos of the dances, and learn to do them on site. 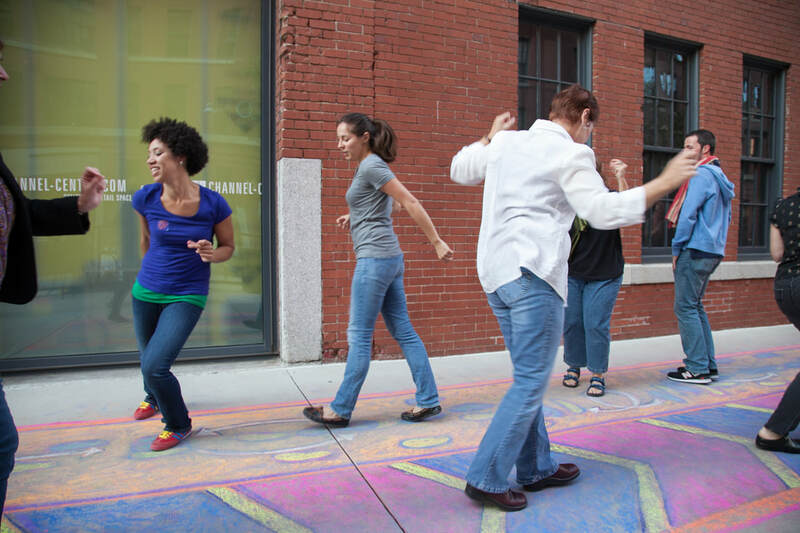 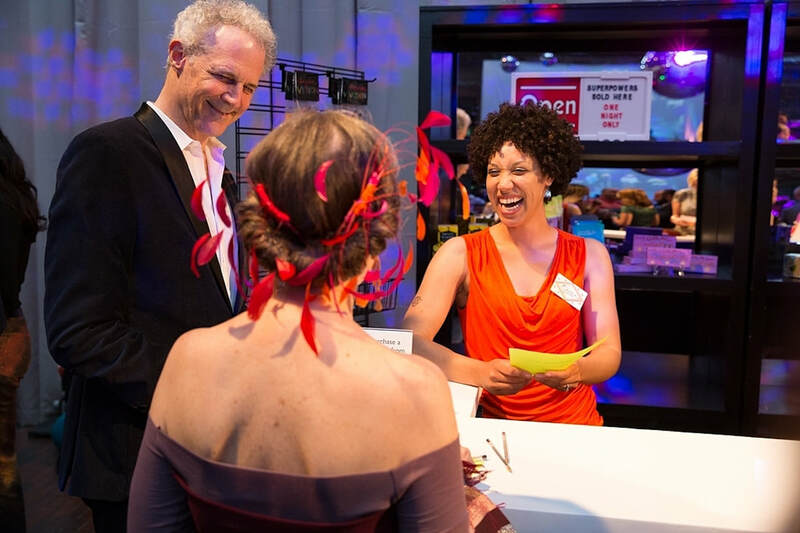 Over the past five years, Dance Spot has engaged with a variety of communities all around Boston, as well as at the DeCordova Sculpture Park and Museum in Lincoln, the Isabella Stewart Gardner Museum in Boston, and Tyler School of Art in Philadelphia. 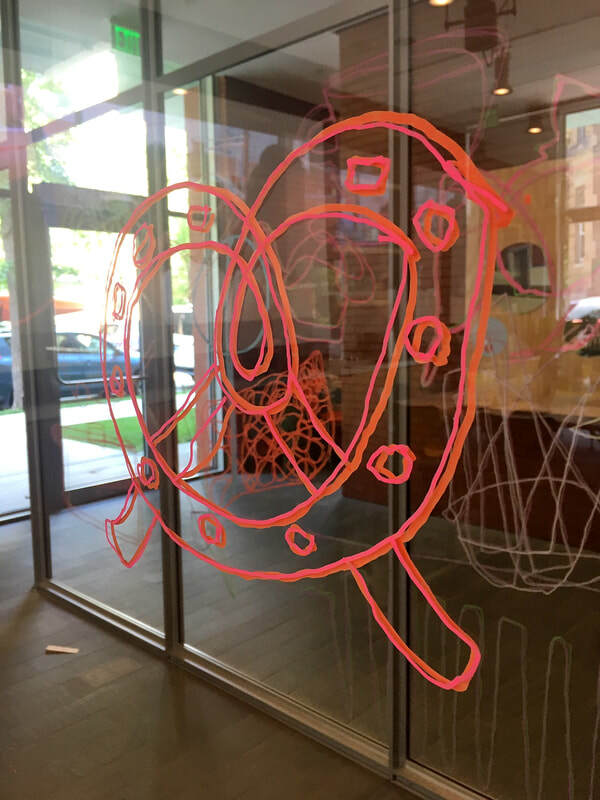 In this 15-week processed-focused residency at Boston Center for the Arts, the artist conceived and created a neighborhood store that sold superpowers. Through community workshops developed and facilitated by the artist, the artist engaged the public with questions and explorations about personal heroism, social responsibility, the superpowers we desire, and the powers inherent to our humanity. 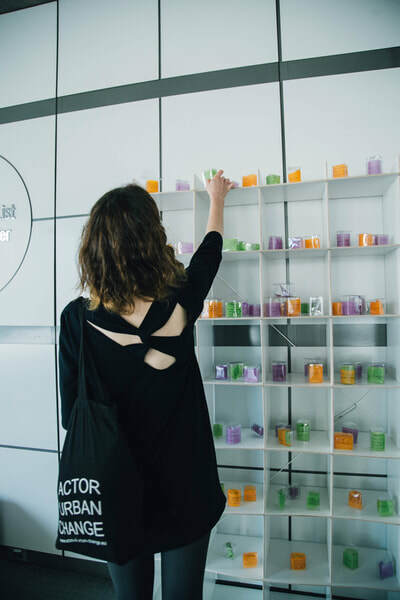 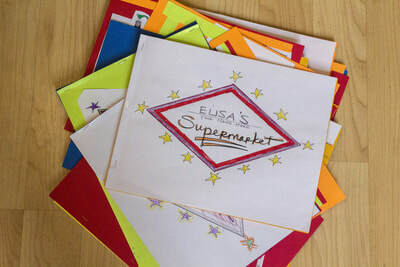 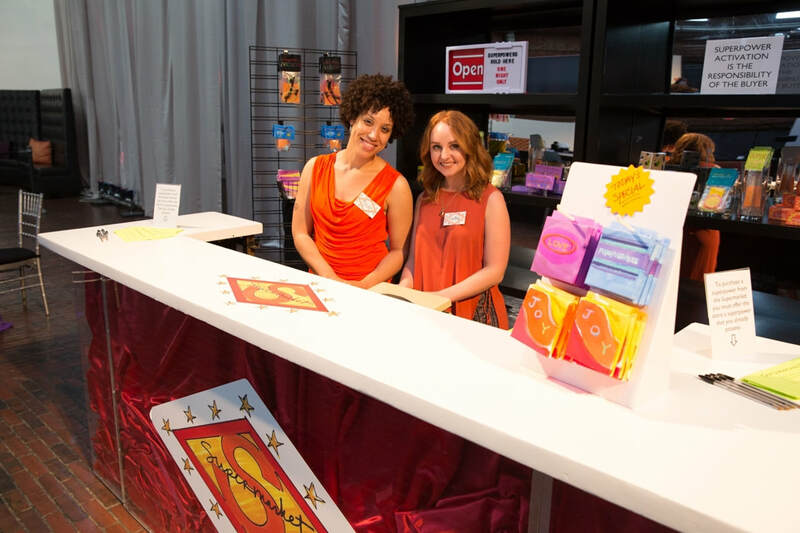 In the culmination of the residency, the artist created the Supermarket itself; the artist crafted a line of 15 different superpower products based on public feedback, and “customers” were invited to purchase a superpower from the Supermarket. 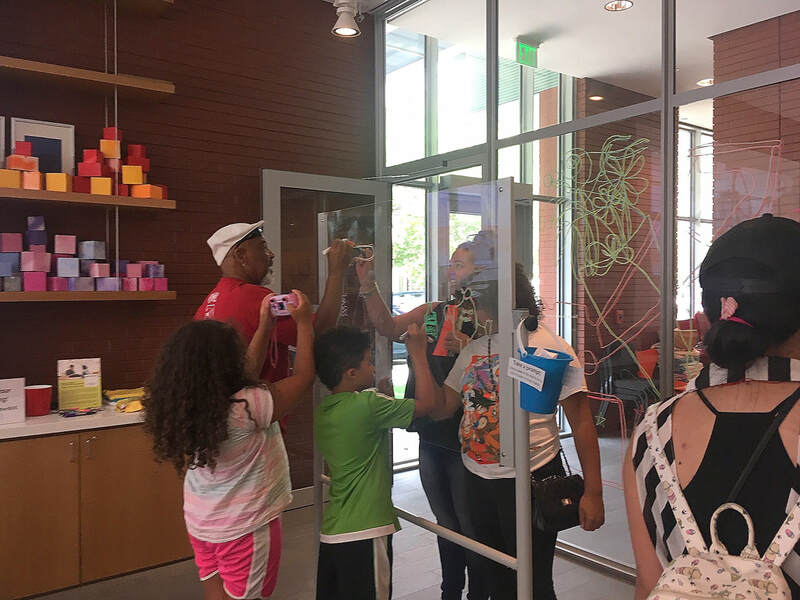 Visitors made their purchases not with money, but by sharing a superpower which they already possessed with the Supermarket. 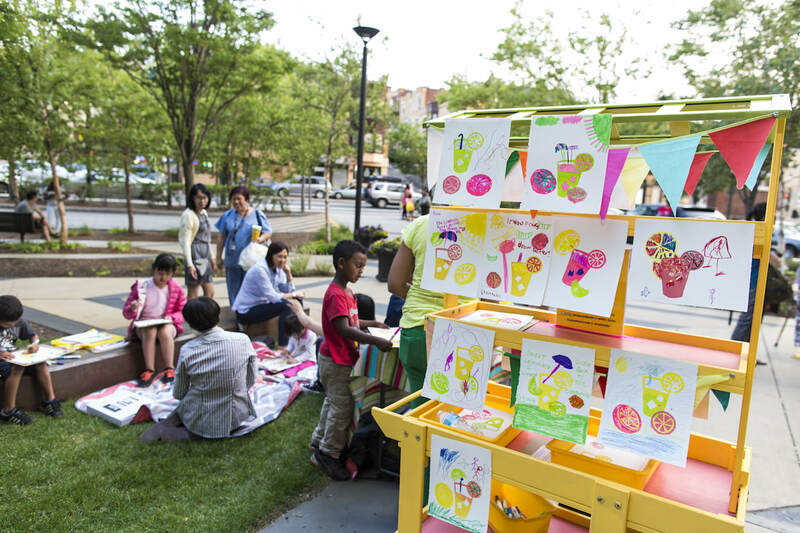 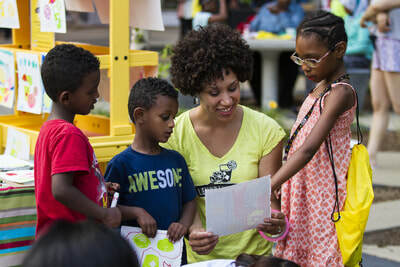 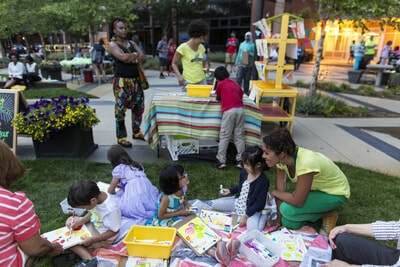 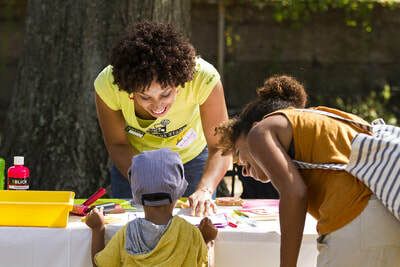 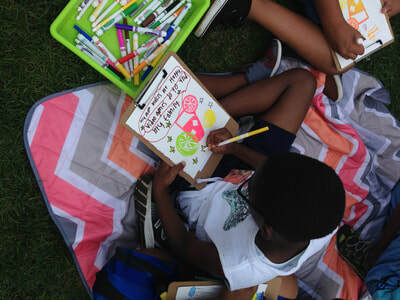 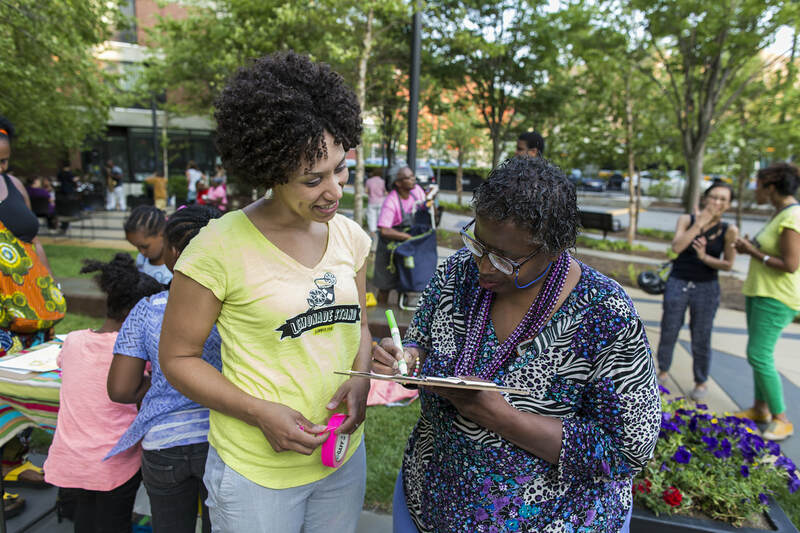 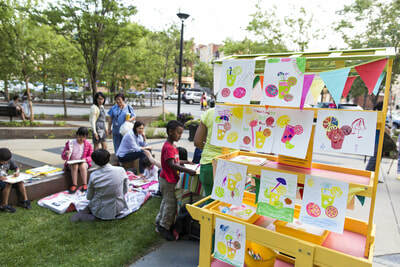 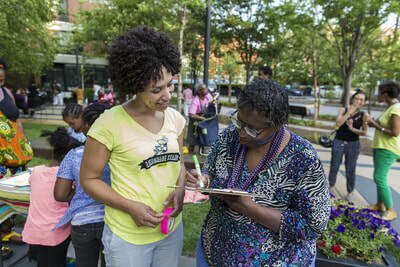 Lemonade Stand, a Creative City project funded by New England Foundation for the Arts, in collaboration with Silvia Lopez Chavez, used a mobile lemonade cart to bring positive story-sharing public programs to housing developments in Mission Hill, Jamaica Plain, and Dorchester throughout the summer of 2016. 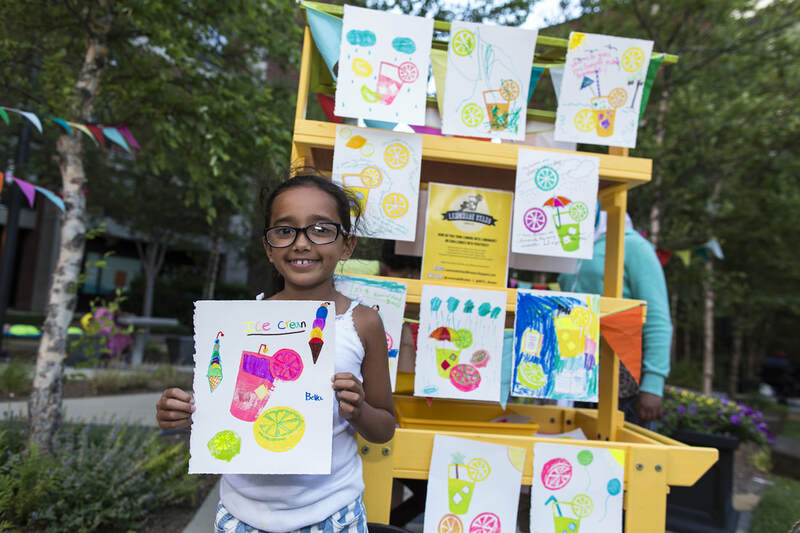 Using the concept of "lemons to lemonade," participants were asked to share - in either pictures or words - their personal stories of overcoming challenges in their lives. 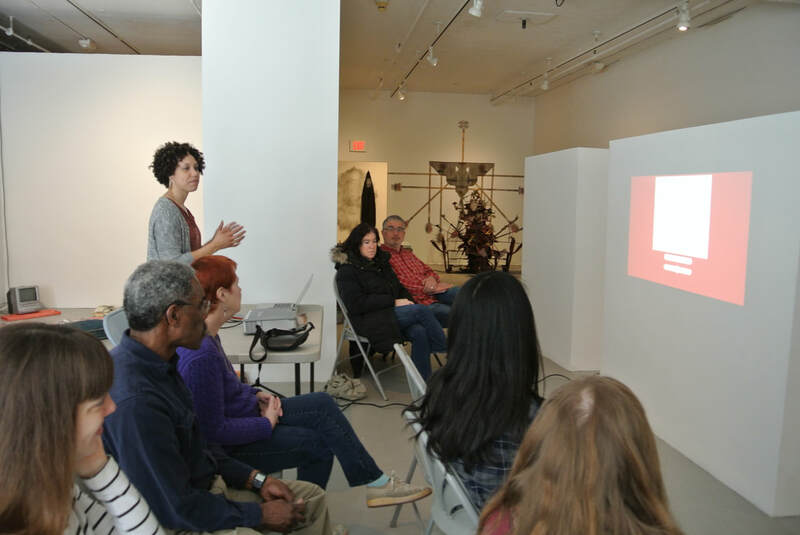 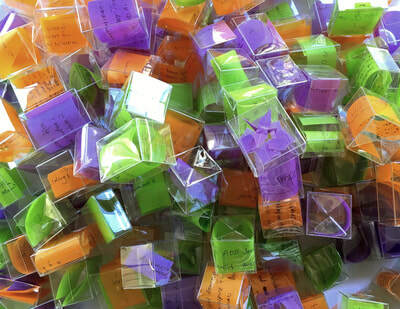 The project took the form of a traveling artist residency with The Eliot School of Fine and Applied Arts. 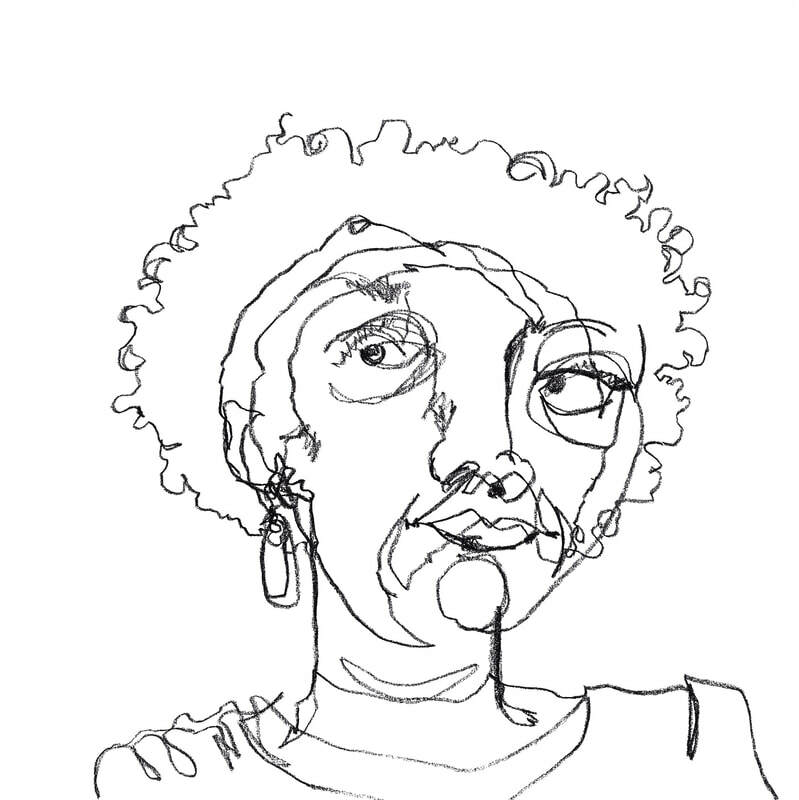 © COPYRIGHT ELISA H. HAMILTON 2015.